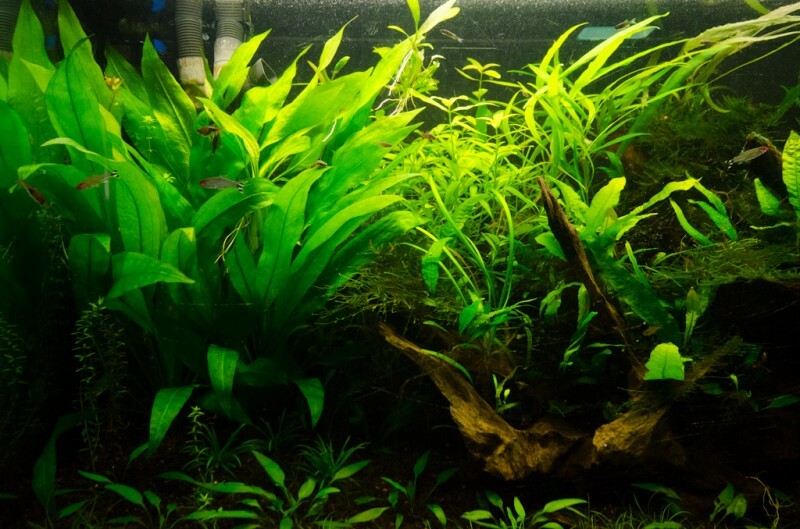 After realizing i was severly suferring from multiple tank syndrome i decided it was time to consolidate a few of my tanks.. but if i was going to cut down on tank s the new one had to be pretty awesome. 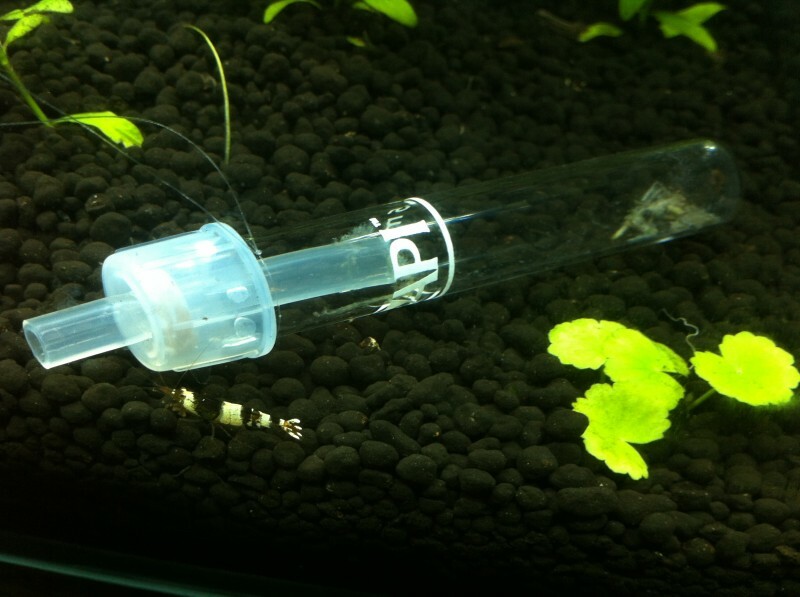 I love the look of Mr Aqua 12G long tanks however it wasnt quite enough capacity to combine a few shrimp tanks..
Let me introduce the innovative marine nuvo 24. 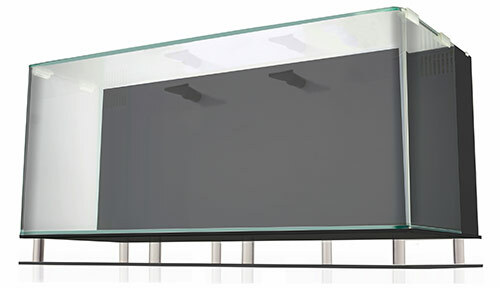 This stylish little tank is is made of 6mm bent glass and has a built in sump… this is generally a salt water thing but seemed perfect to hide all of the equipment and keep that clean look. One of the best part are the dimensions. 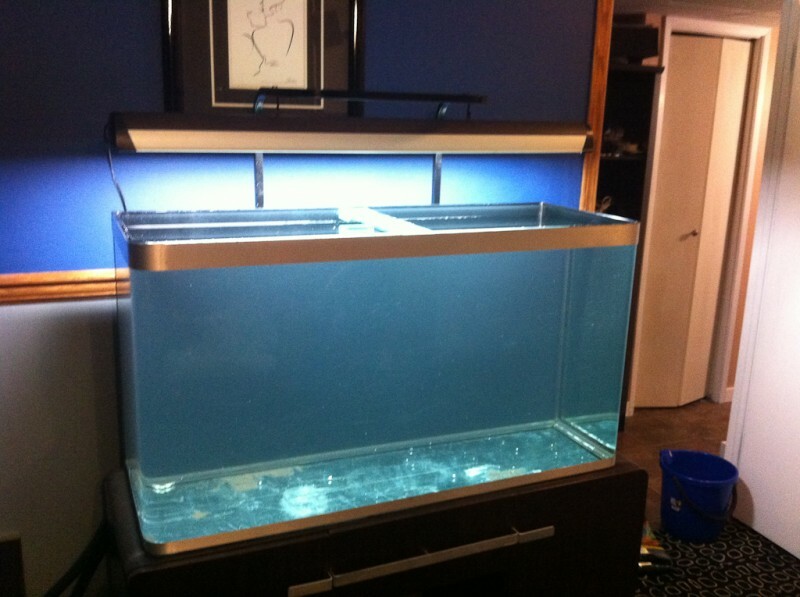 The tank is 36x12x13. 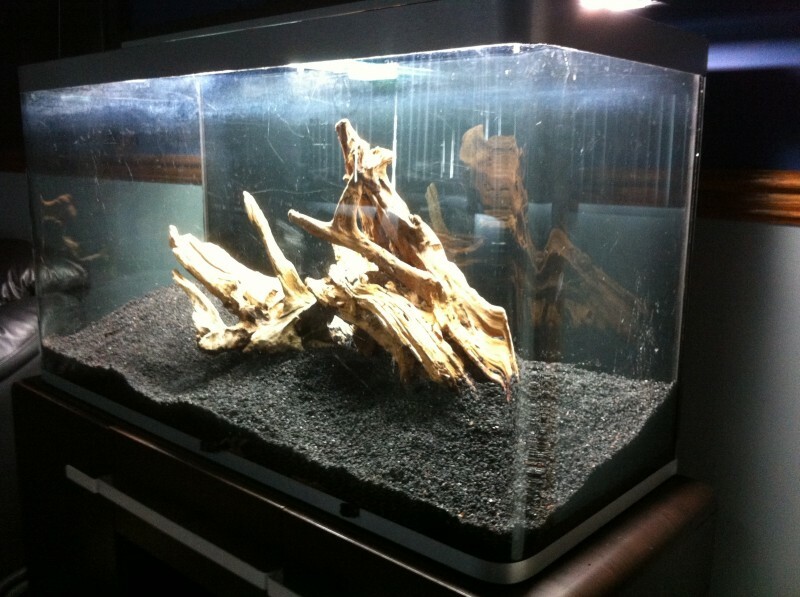 The sump area is about 3″ deep leaving 10″ ish deep for the display area. 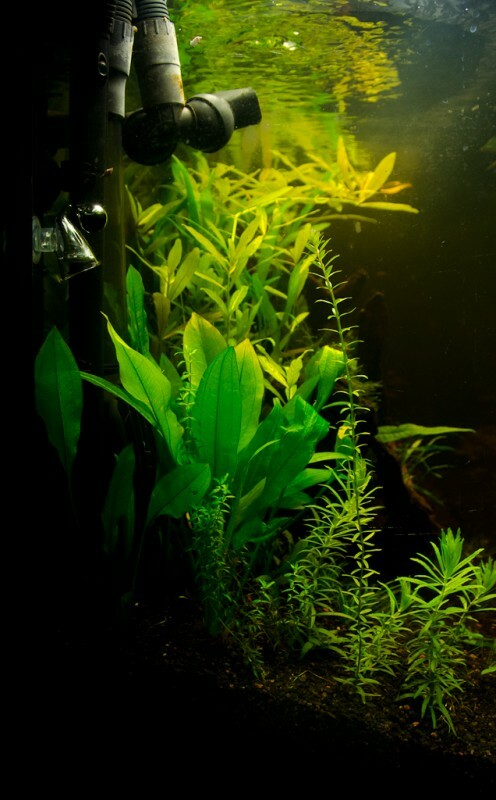 The stock pump is 460 ish GPH which has tons of flow for a small thank however i feel its a bit overkill for my shrimp (and a little loud) so i just ordered a Sicce Syncra Silent 1.0 Pump – 251 GPH. 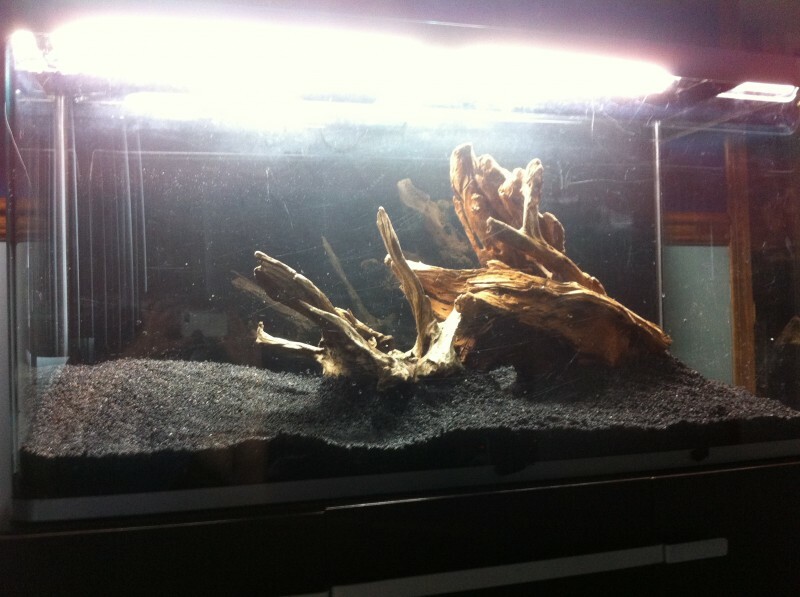 The wood for the scape was stolen out of my other nano tanks. After about 20 different spaces i finally designed on a layout using 3 chunks of driftwood into one feature. 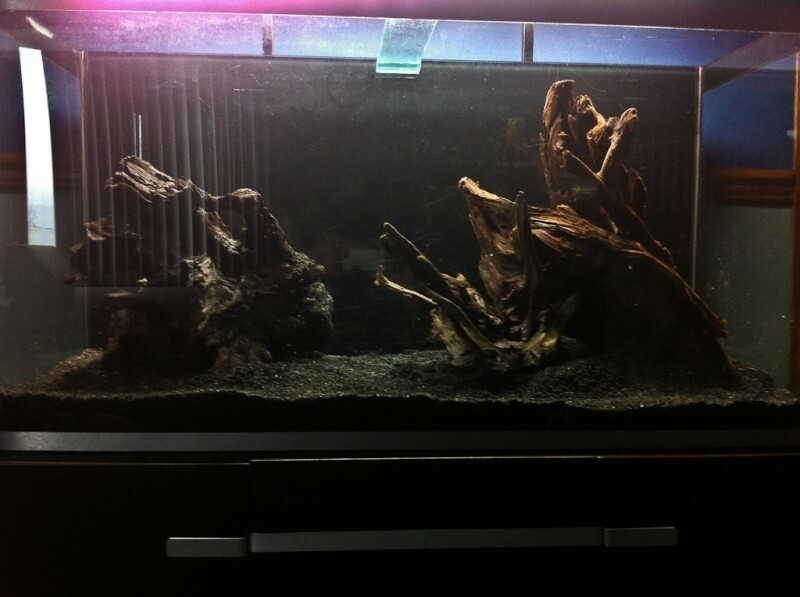 For my new tank i decided to go with Glosso due to is ease of maintenance.. but omg was it a slow proccess. 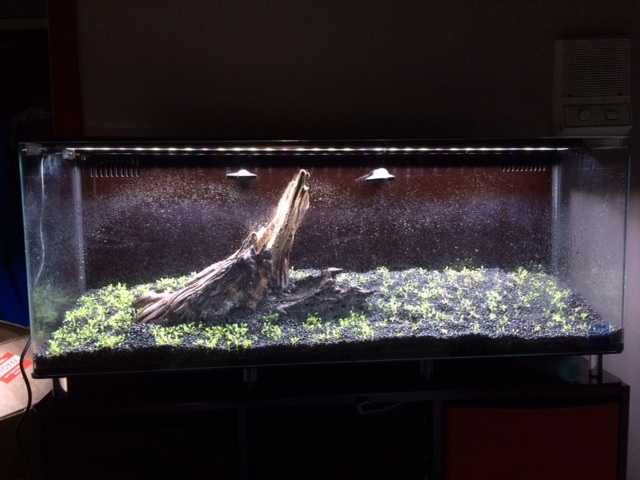 I had a lush carpet of HC in a little over a month. 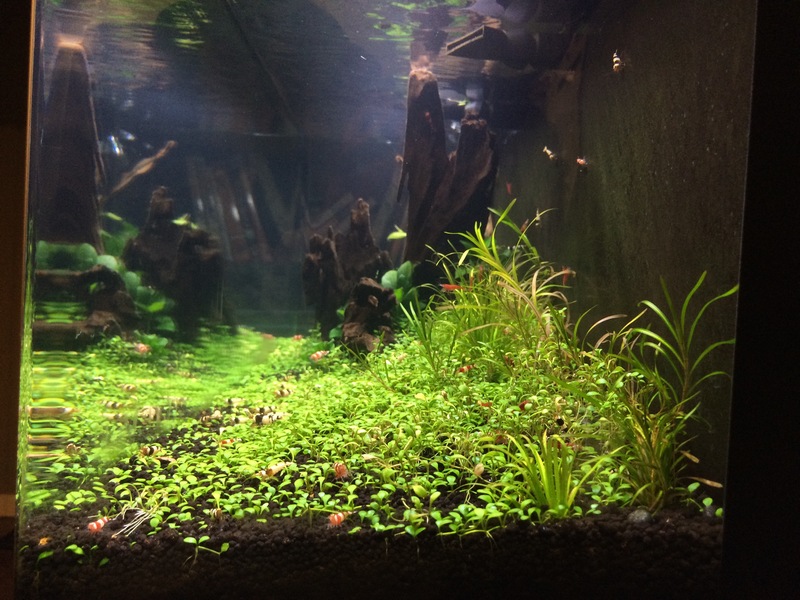 my glosso dry start had two months to grow before i start to fully fill and even when flooded 2 months later it still had lots of work todo. Now with a pretty cool design ready i needed to find a stand. 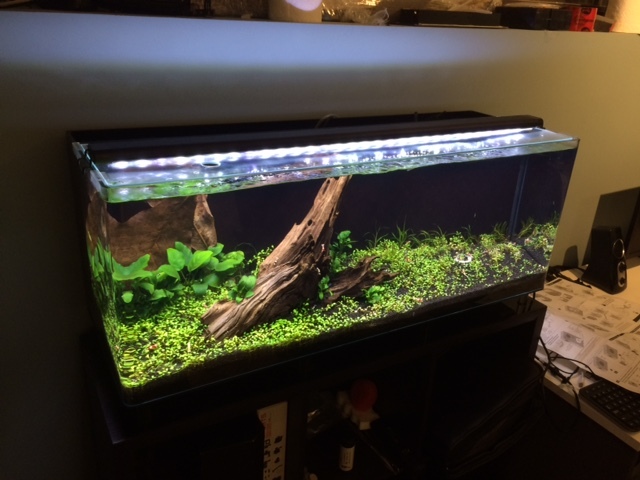 The cube stand I had was 36″ wide and fit the tank perfectly.. however it was pretty flimsy and I didnt trust it with 150lbs of water ontop of it. Time to re-enforce it! 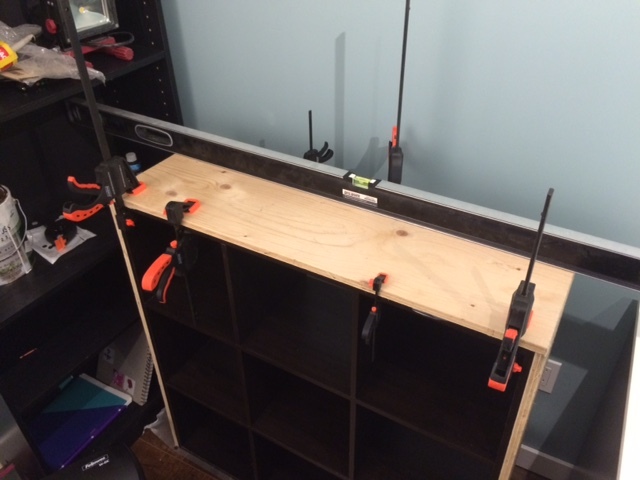 To add strength I glued strips of 5/8″ plywood to the stand using PL400 , clamped it down and let it dry over night. 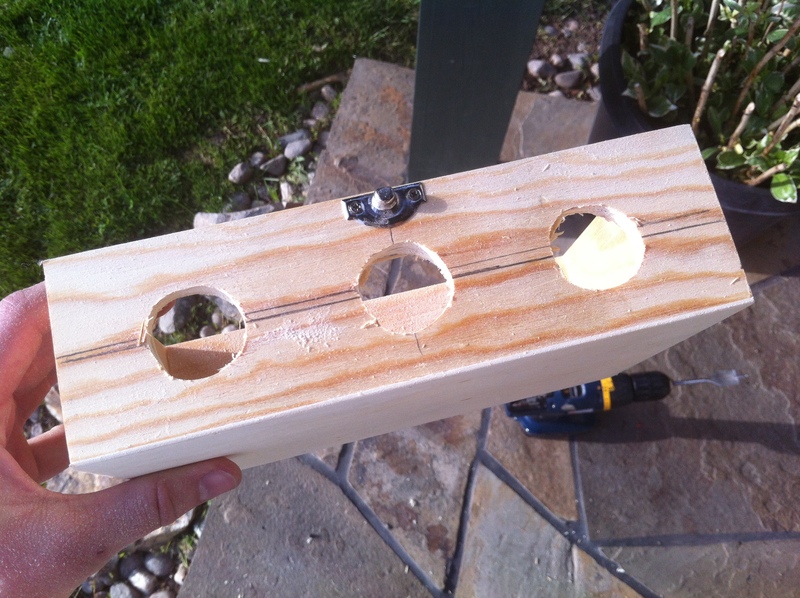 Once dry i used a bit of drywall mud to smooth it out and bled the seams from the origional stand with the plywood. with the structural work done it was time for paint. And i do say it turned out awesome! 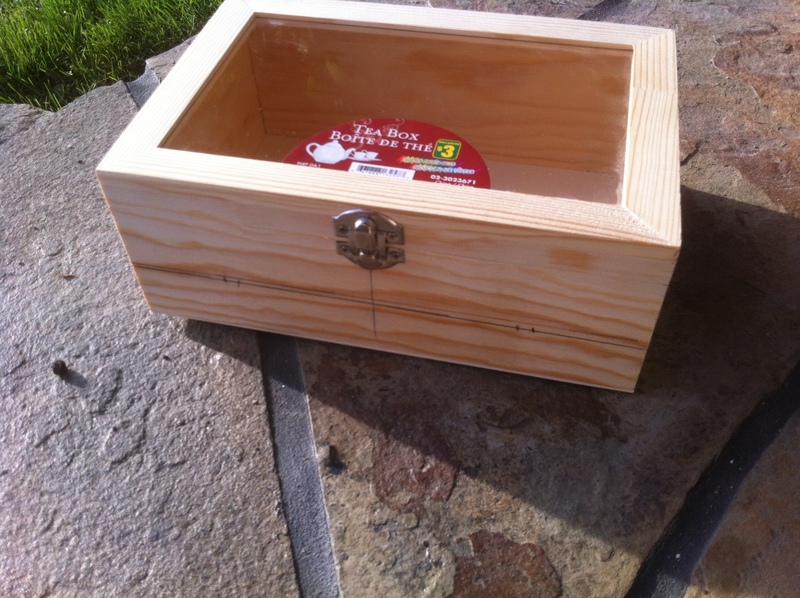 The seams blended perfectly and gave the stand a nice chunky look… which a weight worthy stand ready it was time to fill it. Well it’s been a good month plus since the last update and the glosso is slowly but surely spreading. 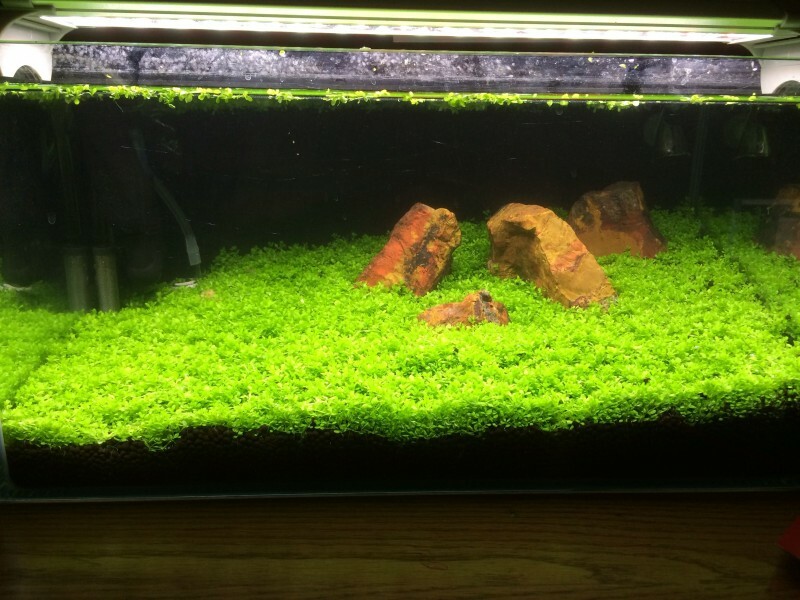 I finally almost have a nice lush carpet! 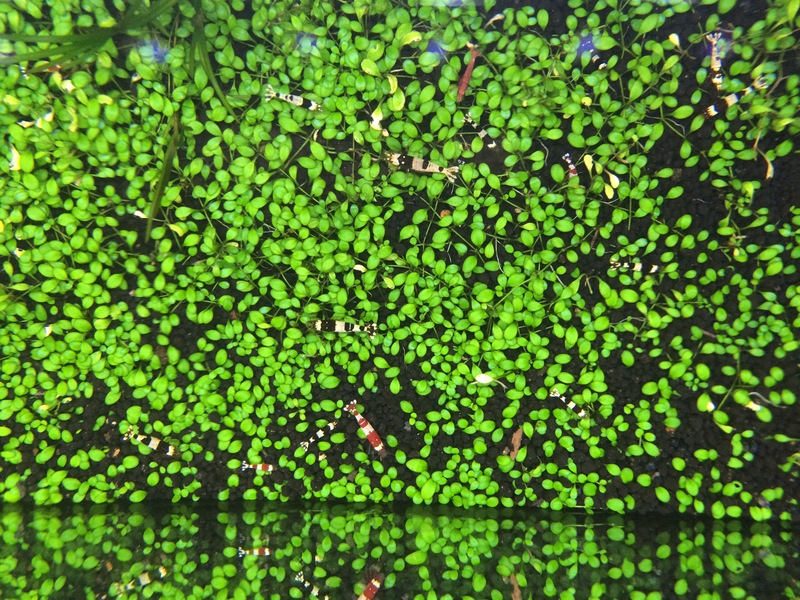 Many aquatic plants can be grown emersed rather than submersed. 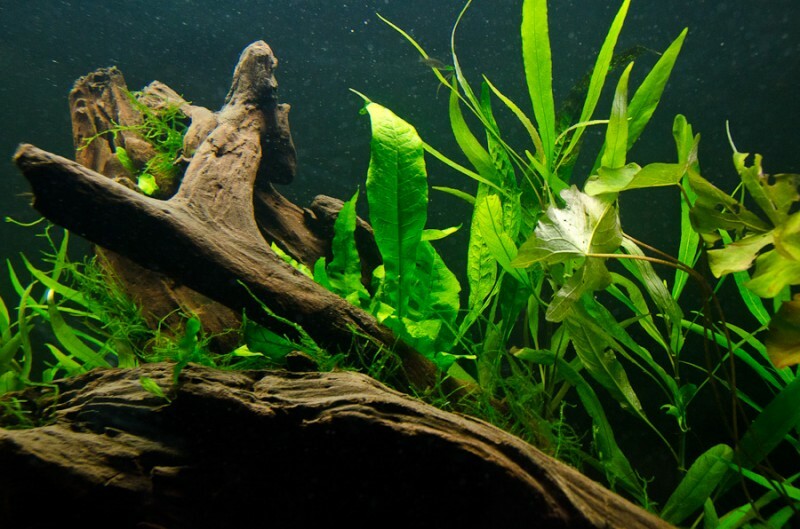 The main reason to grow a plant immersed is faster growth. The air around us has an abundance of CO2 which greatly accelerate plant growth. 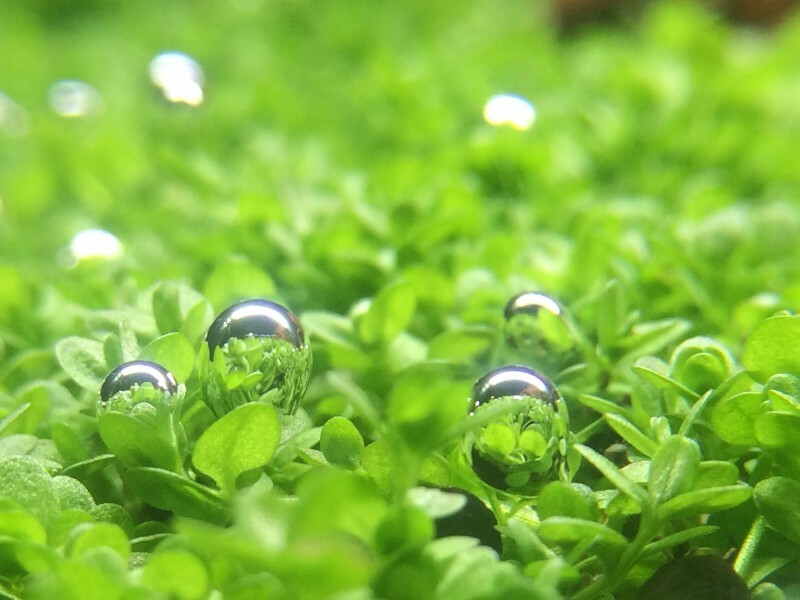 Hemianthus callitrichoides commonly known as HC or Dwarf Baby Tears is an excellent example of plant that can grow both submersed and immersed. 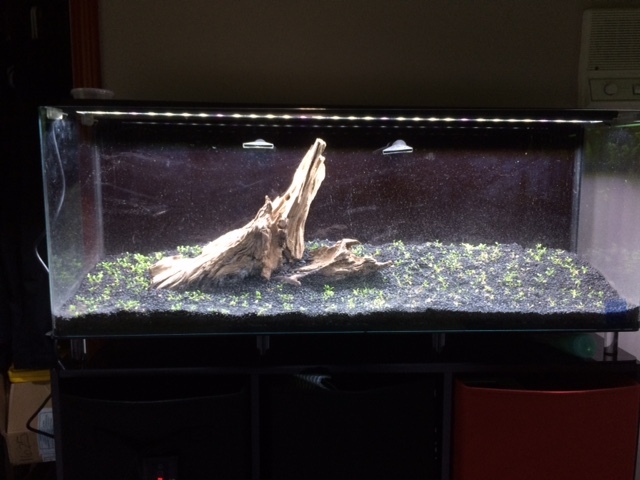 I decided to try out the Dry Start Meathod (DSM) in 6 Gallon fluval edge tank with the top removed. 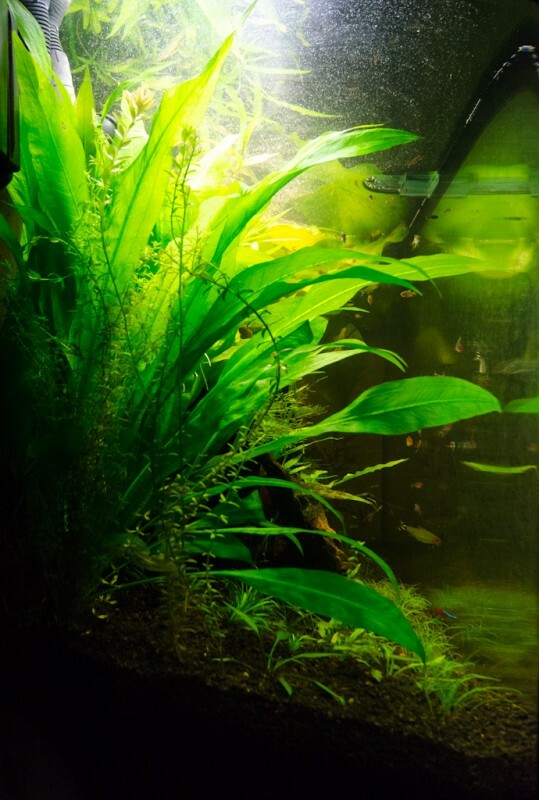 HC originates from Cuba and loves a humid environment. HC loves a soft smaller grained soil, this ensure the delicate roots can make they way down with minimal resistance. 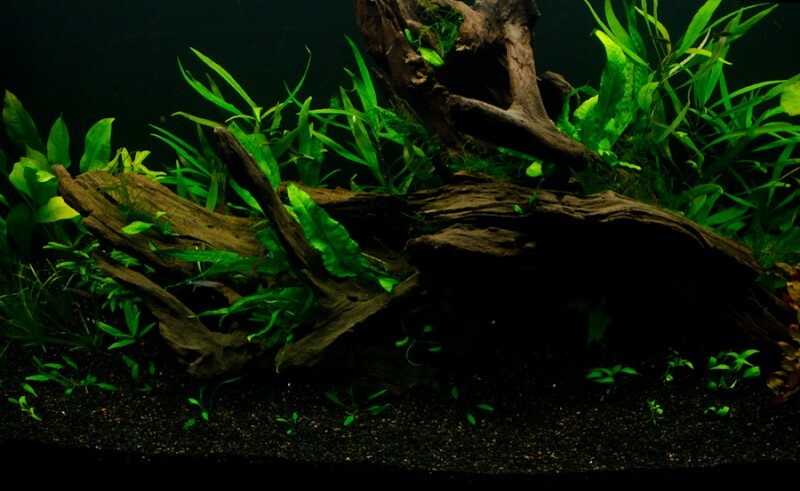 In my case i used Fluval Stratum due to local availability. 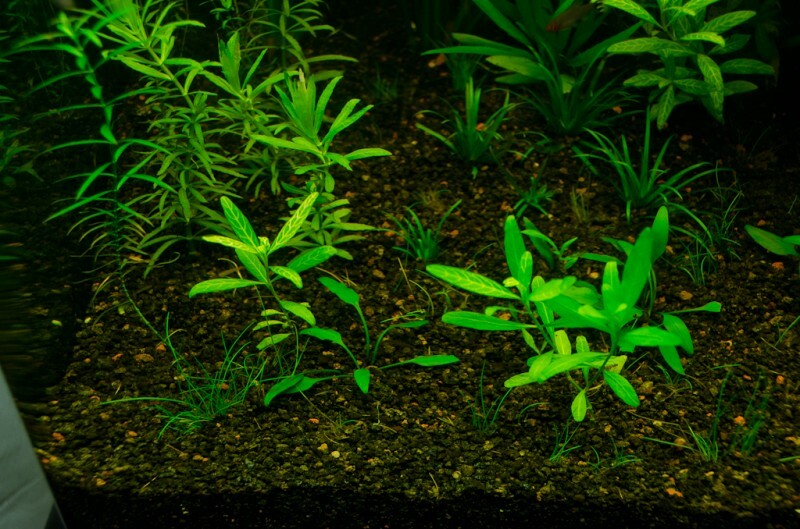 For lighting I decided to try out Finnex’s new planted plus led light.. which so far is yielding fantastic results. 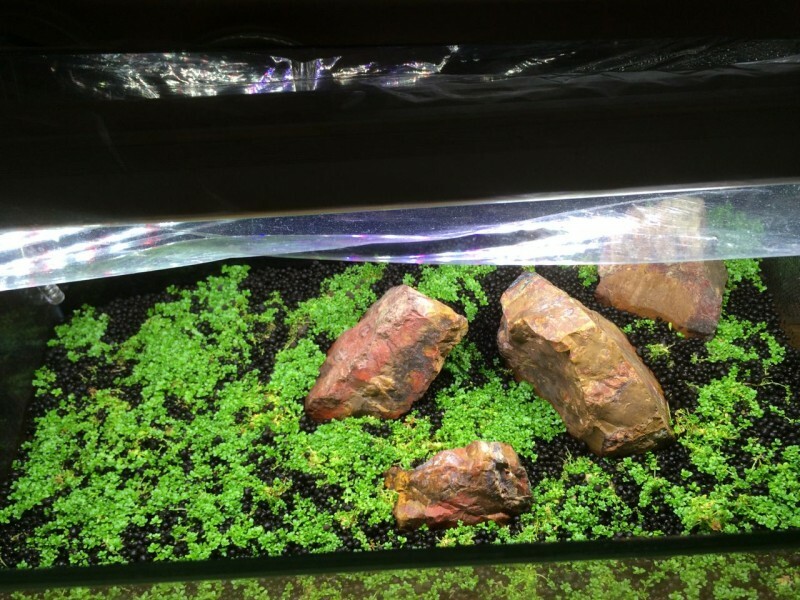 If HC does not have enough light it will grow vertical rather than spreading across the substrate to form a lush carpet. 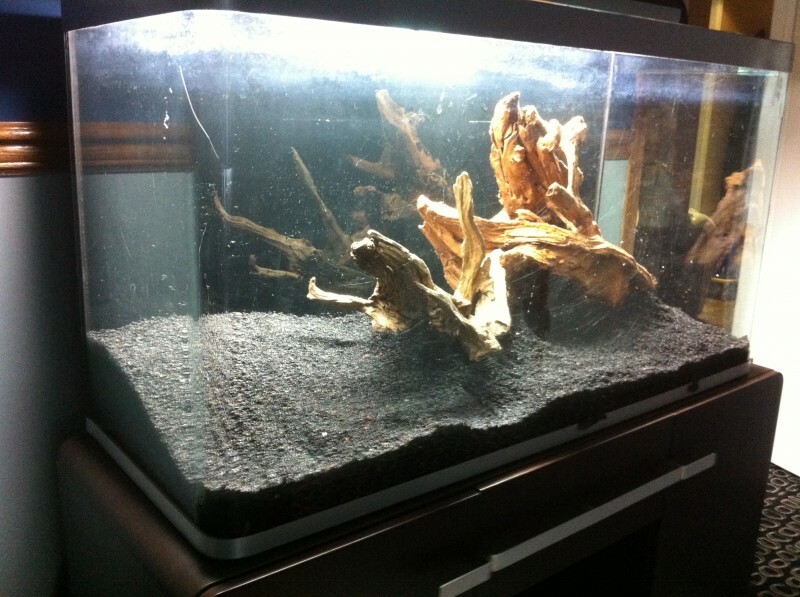 To start you will want to find a foal point (either rocks or driftwood) and play around to find your desired look. 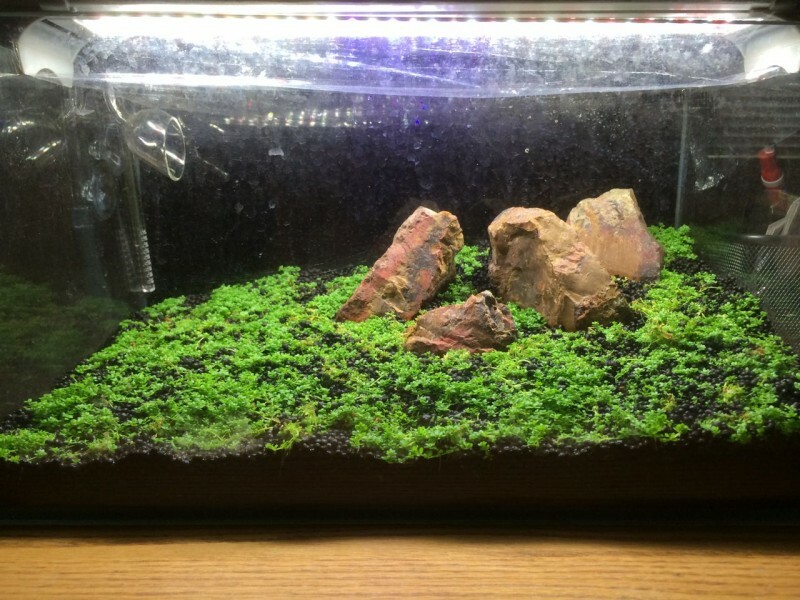 This can be a interesting process.. i know i tried at least 20 different combinations of rocks and layouts until i decided on this one. 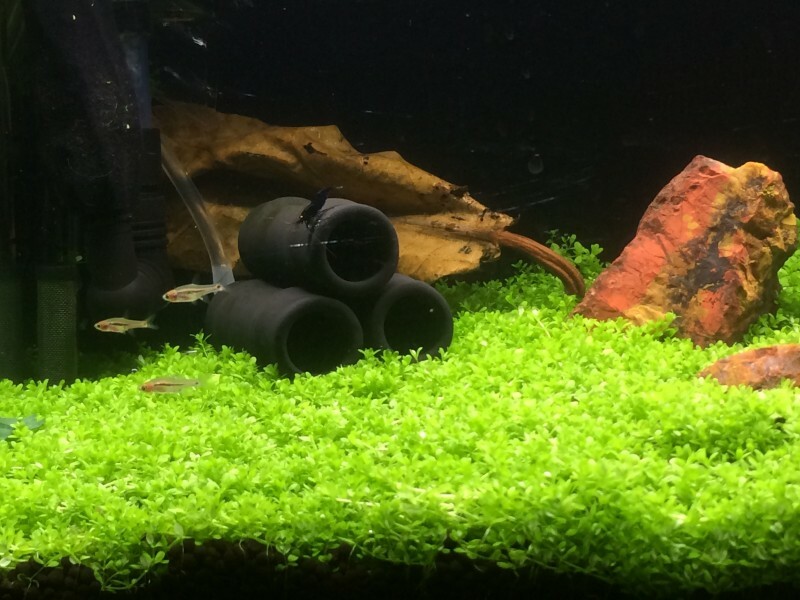 For the 6 Gallon tank i used 2 pots of HC.. three would have been nice but two is doing the job. You ideally want to plant small plugs about an inch apart for maximum spread. You can get quicker spread the more you break up the bunches.. this can however be a time consuming process.. so get comfy! Insert each mini clump with long tweezers and ensure the roots are within the soil. I try to leave just the top leave above. 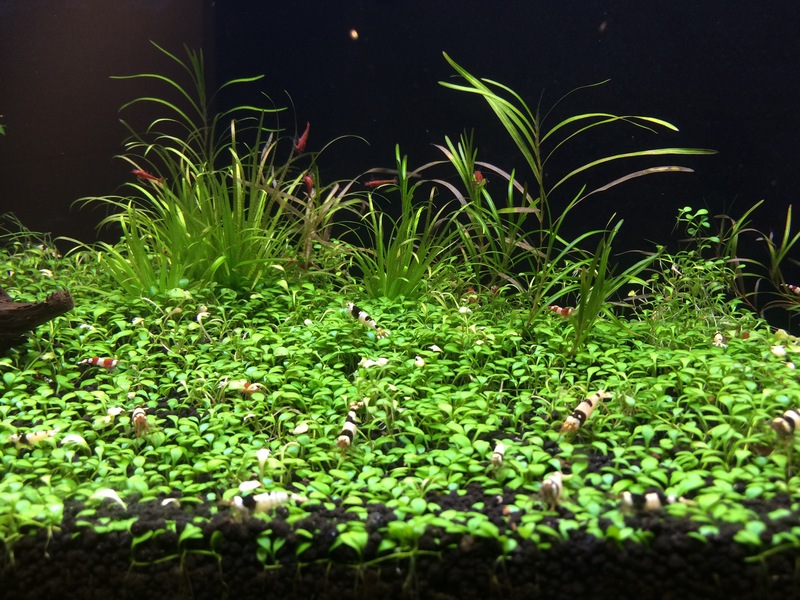 I also randomly inserted about 8 root tabs to aid in future growth once flooded. 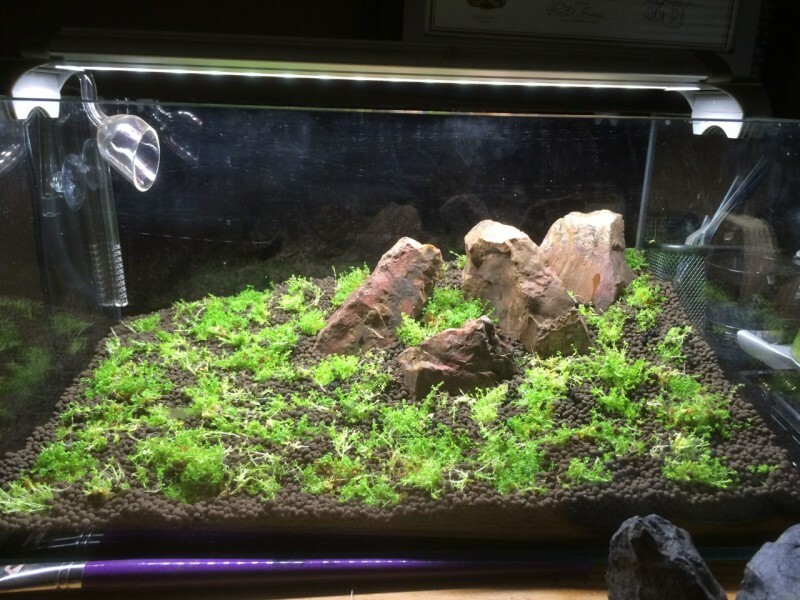 I filled a spray bottle with distilled water and a bit of Excel (metracide 14) to help prevent any mould or algae from forming. 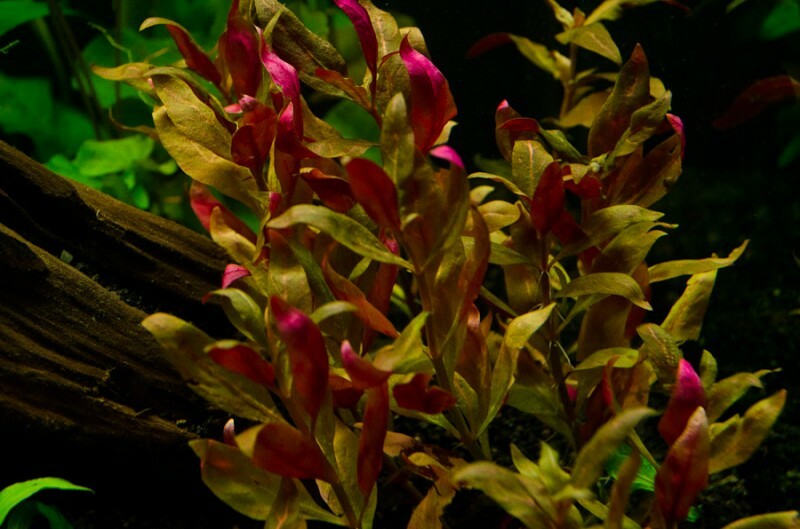 DSM does work very well.. how ever it does require patience.. but that seems to be most thing when it comes to aquascaping. 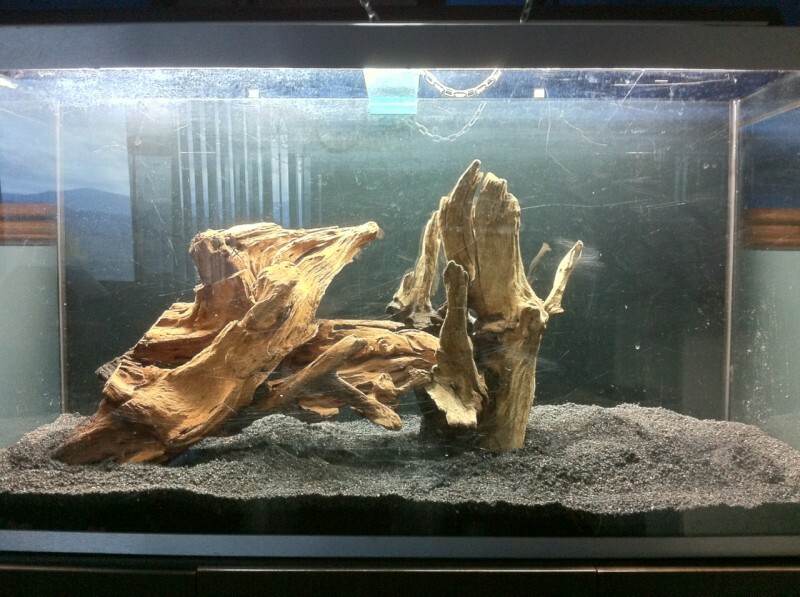 After another week or two i will flood the tank. Once flooded the HC will be starved for CO2. 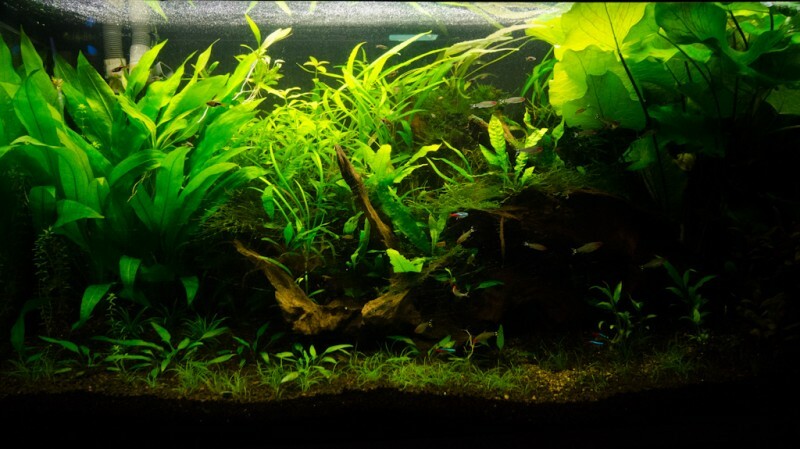 I plan on injecting pressurized CO2 at a high rate for the first 4-5 days to allow the HC to adapt.. then i will slowly lower the CO2 over the next week or two until it is at a low steady ammount. 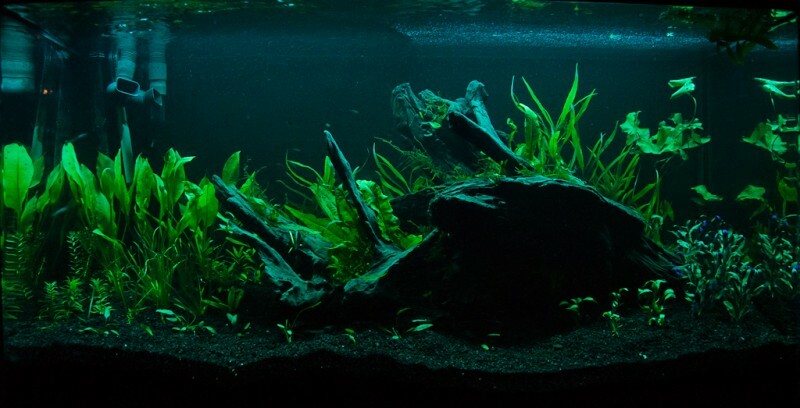 I plan on using this tank for fancier shrimp (who generally dont like high CO2 or PH swings..) so I plan on getting the CO2 as low as possible while still keeping the the HC happy. 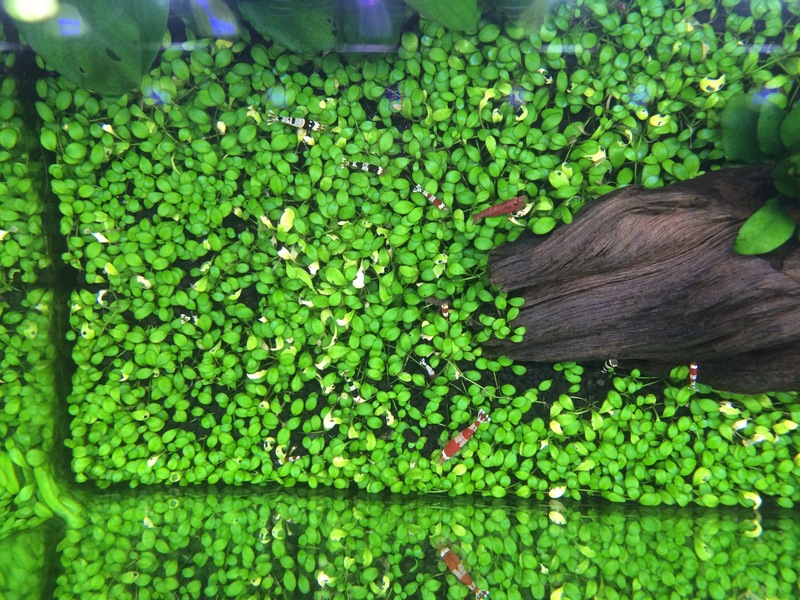 Just over 4 weeks in we have a lovely carpet of HC taking over the tank! 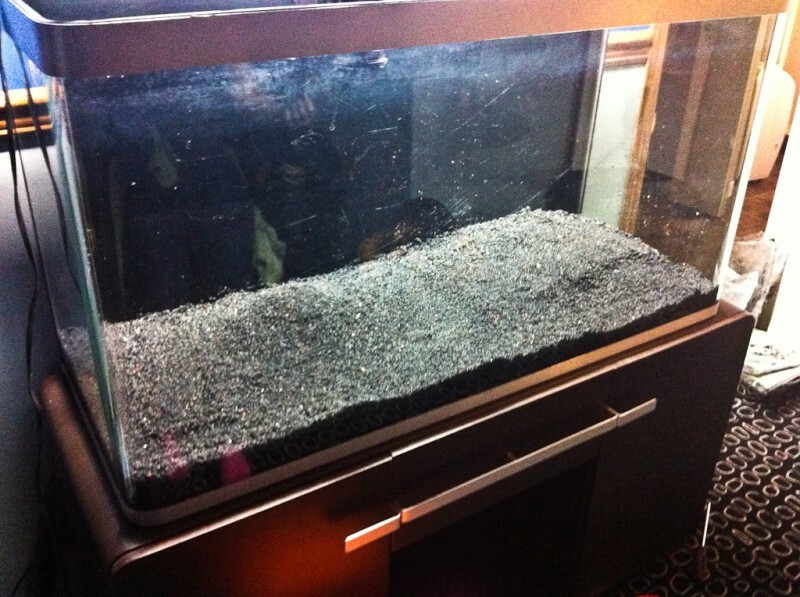 IT looks so nice its time to flood it. 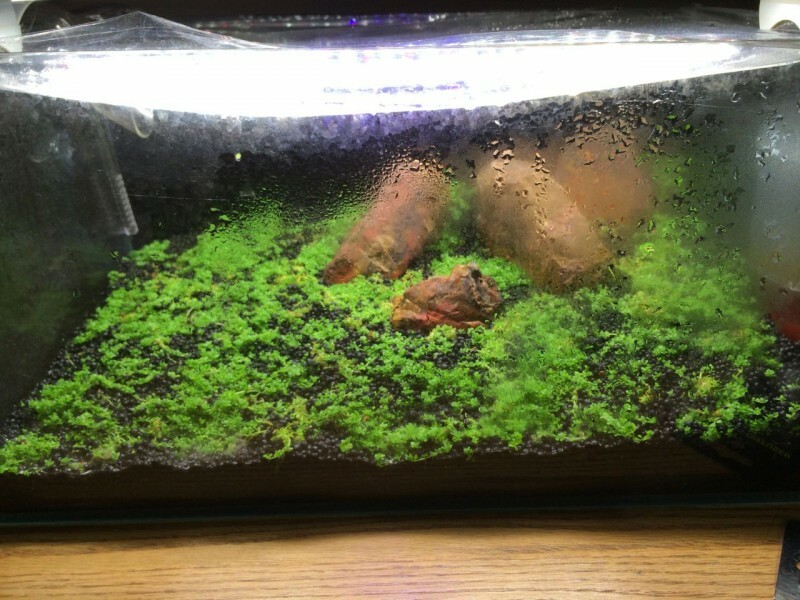 Since i have such a shallow tank I decided to burry the ceramic co2 diffuser into the carpet to to partially hide it and give the bubbles a little more time to float up.. 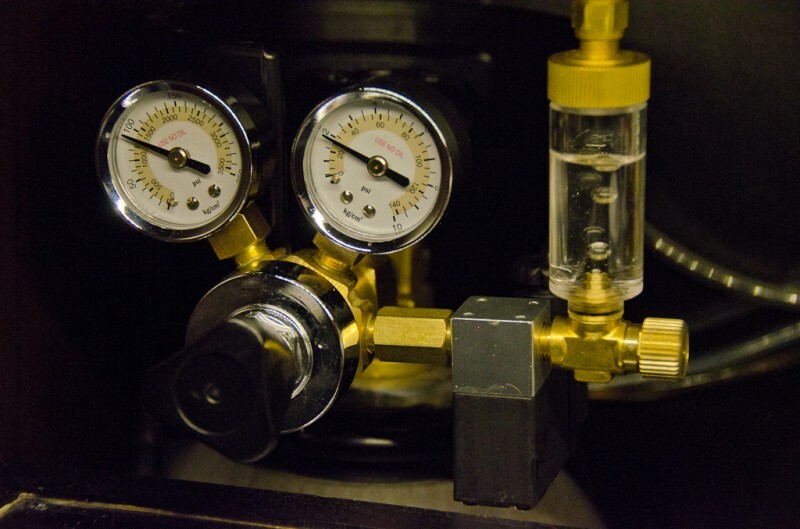 The output of the lilly pipe is aimed so that it pushes the bubbles across the tank allowing more diffusion time. 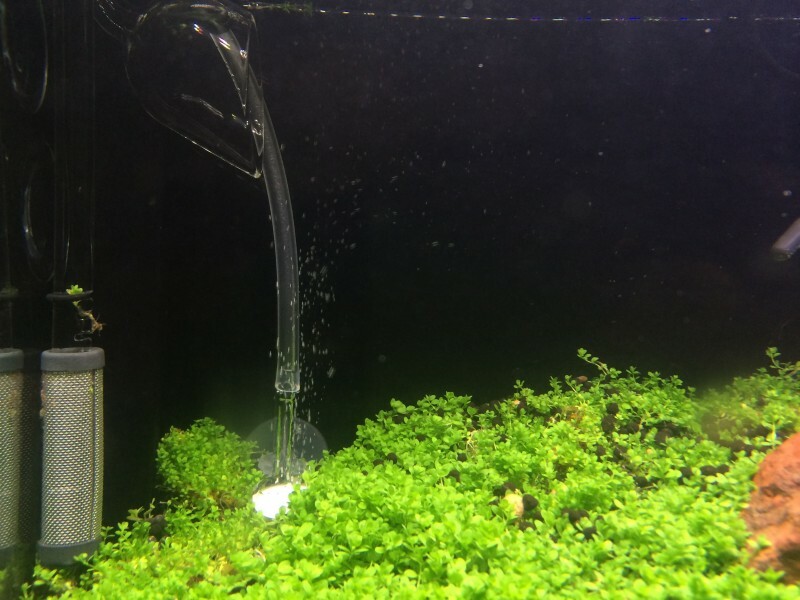 I set the CO2 to 3-4 bubbles /second for the next 4-5 days then turned it down and added a few CPD’s for the next 1.5-2 weeks while still slowly lowering the CO2. 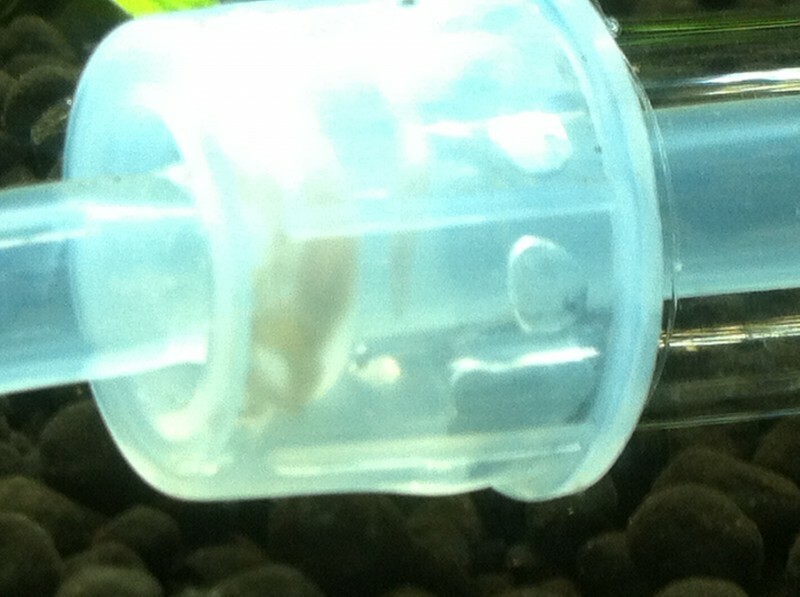 The HC looks happy and is pearling! 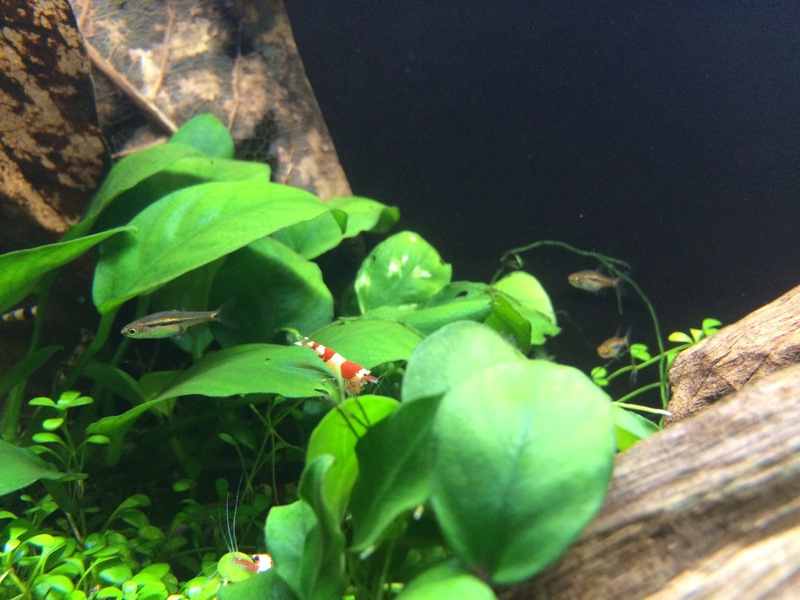 Once i got the bubbles down to 1 ever 2-2.5 seconds i decided it was time to add in my shrimp. 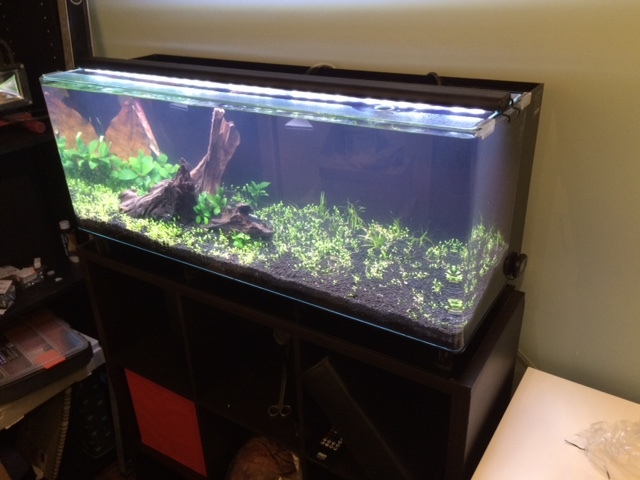 One of the OEBTs enjoying its new home! 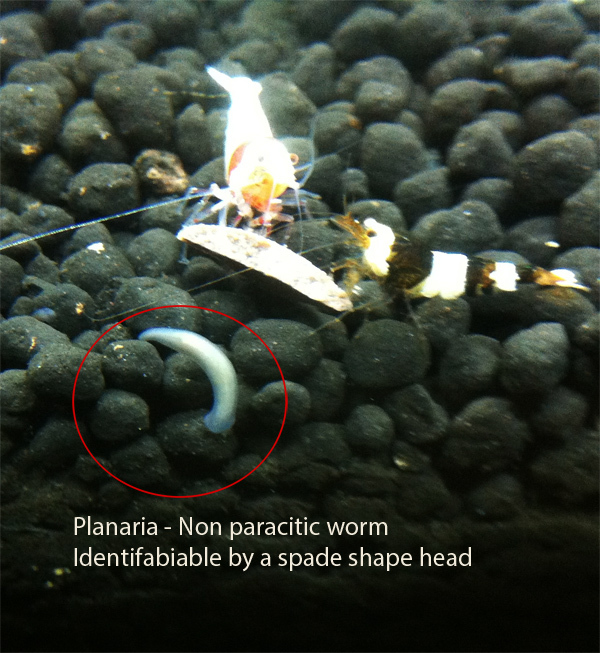 Planaria are non-parasitic flatworm worm that can appear in your aquarium. 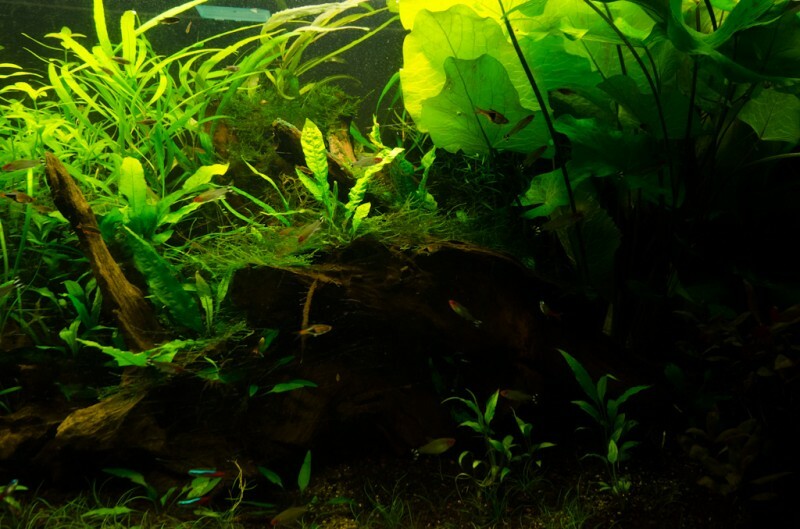 Planaria are easiest identified by there flat body and spade shaped heads. 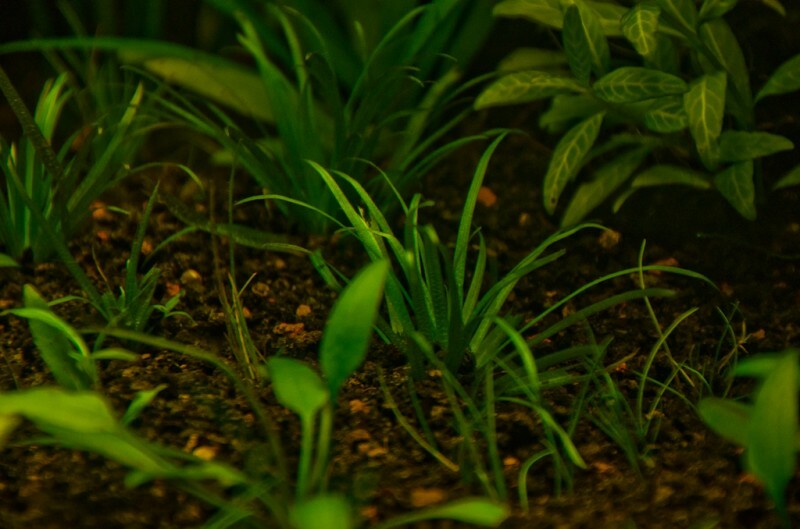 Many claim that they are harmless and just an eyesore however that has been claims that they may hurt or stress out baby or week adult shrimp. 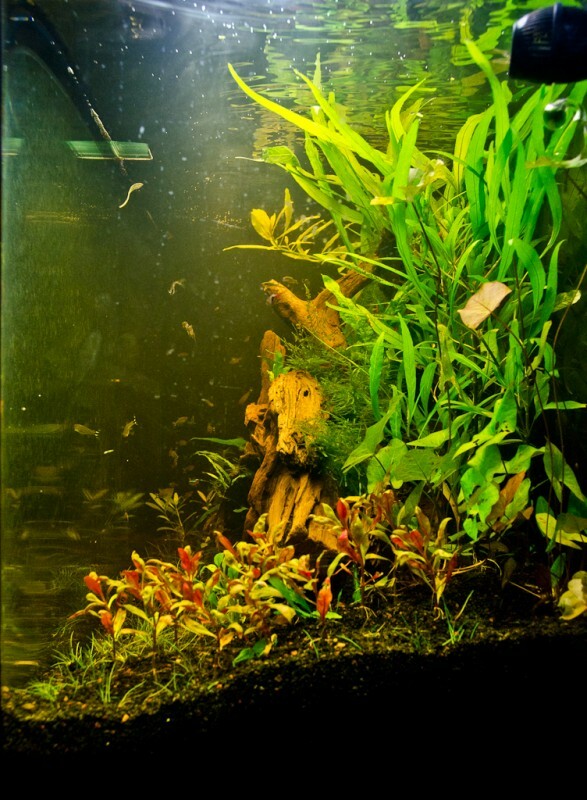 The two main way s to get rid of planaria is by chemicals or diy traps. Traps may not 100% guarantee removal unless used over an extended period they are however non invasive and remove the risk of any of your other under water creatures being hurt by chemicals. If you choose to go down the chemical warfare route the most common option is a dog dewormer containing fenbendazole such as safeguard. 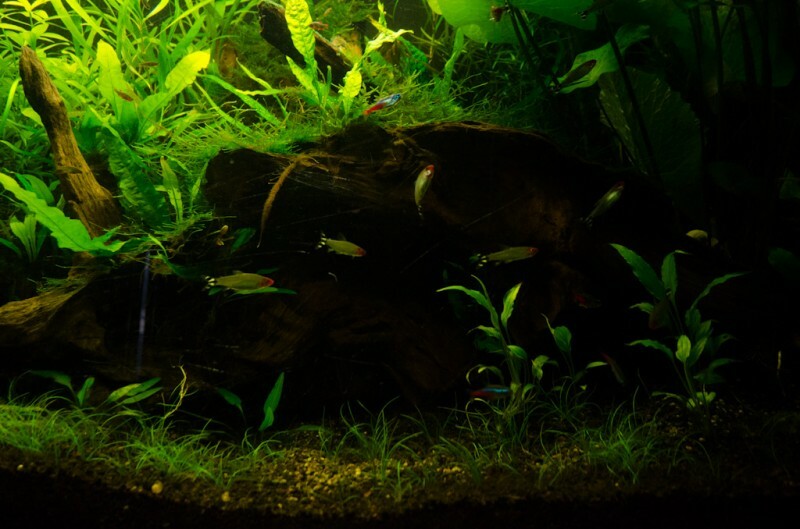 The agreed upon “safe” dosing of fenbendazole is .1 grams per 10 Gallons of aquarium. 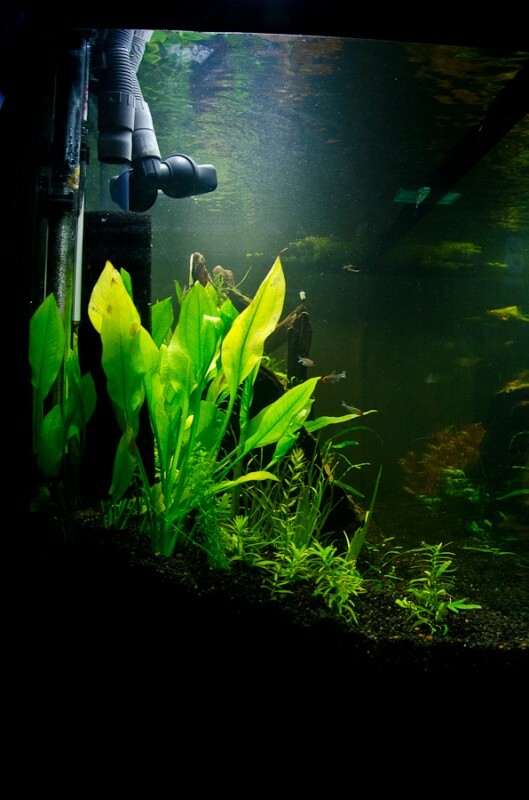 Be sure to remove any carbon that my be in your filter as it will absorb the chemicals and defeat the purpose of dosing the tank. 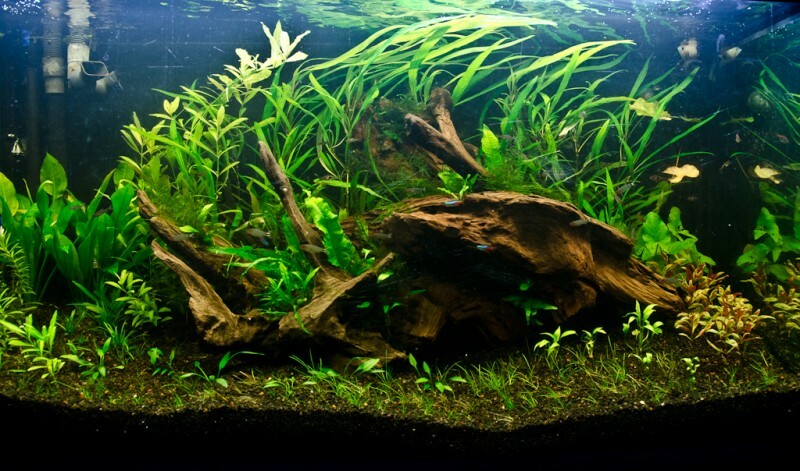 Within 48 hours your planaria should all be dead. 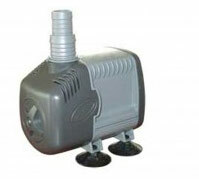 Vacuum away and enjoy a pest free tank. 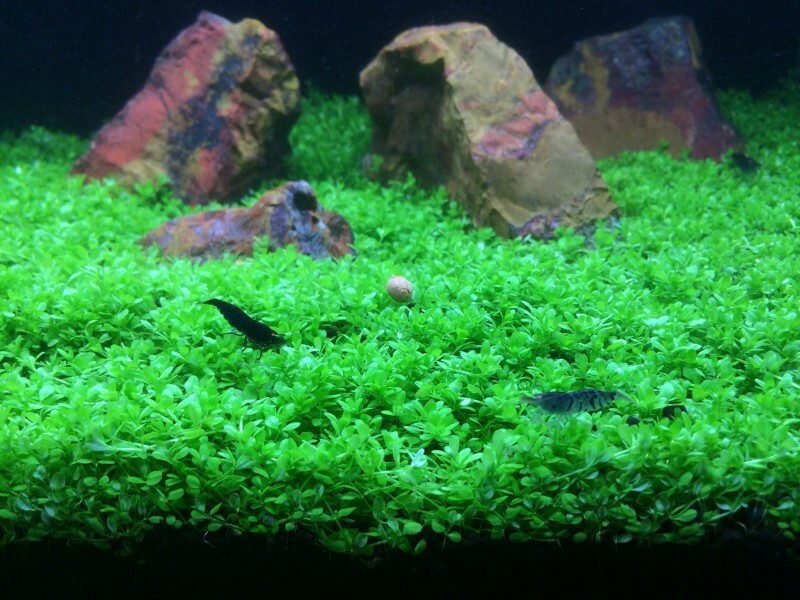 In my shrimp tank i just moved in some Crystal red and Crystal Black shrimp.. 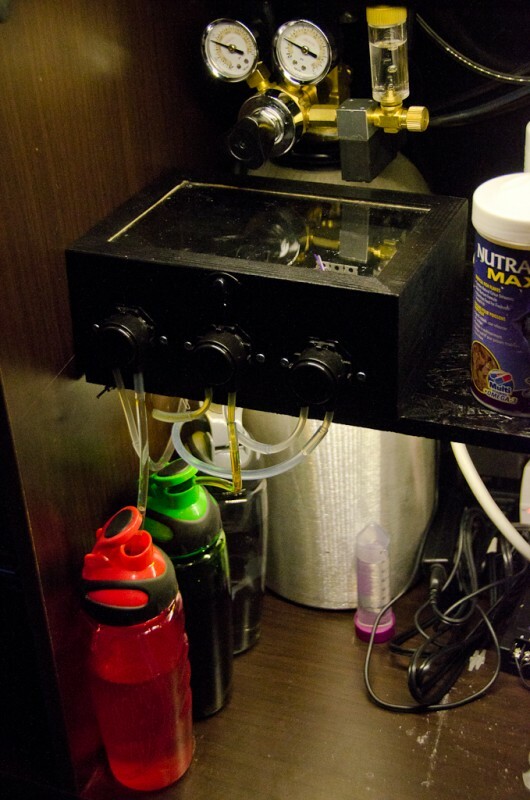 I didnt want to use chemicals after just moving them and decided to build a DIY Planaria Trap. You can purchase them but they can be a bit pricey for such a small device. To build mine i used a test tub from a test kit, and some airline house. 3. 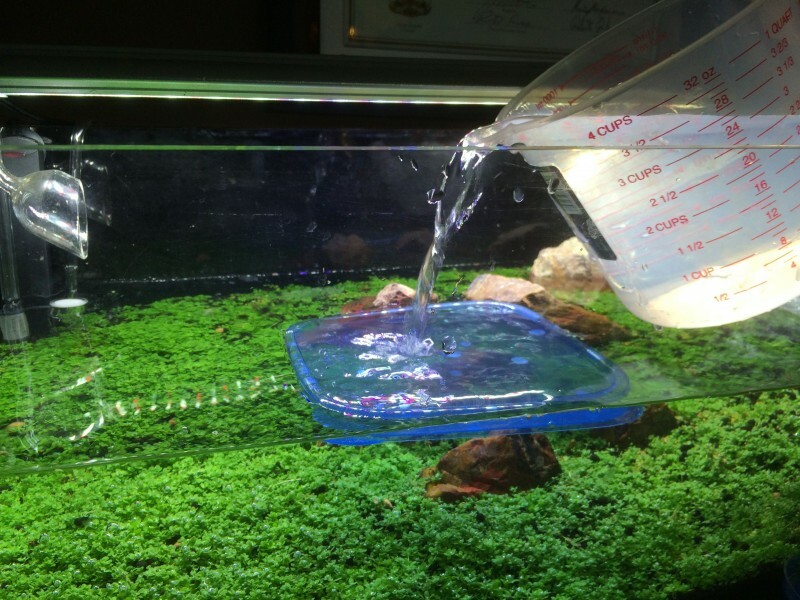 Fill your trap with tank water and bait it with meat, shrimp, blood worms or some other form of tasty raw food. 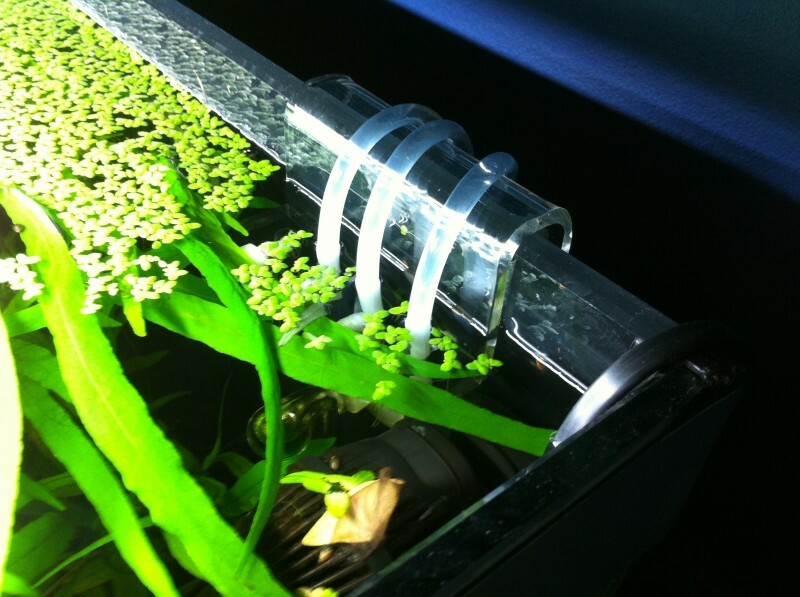 I left this trap overnight and work up to bout 5-6 planaria in the trap so it seems to be working well! 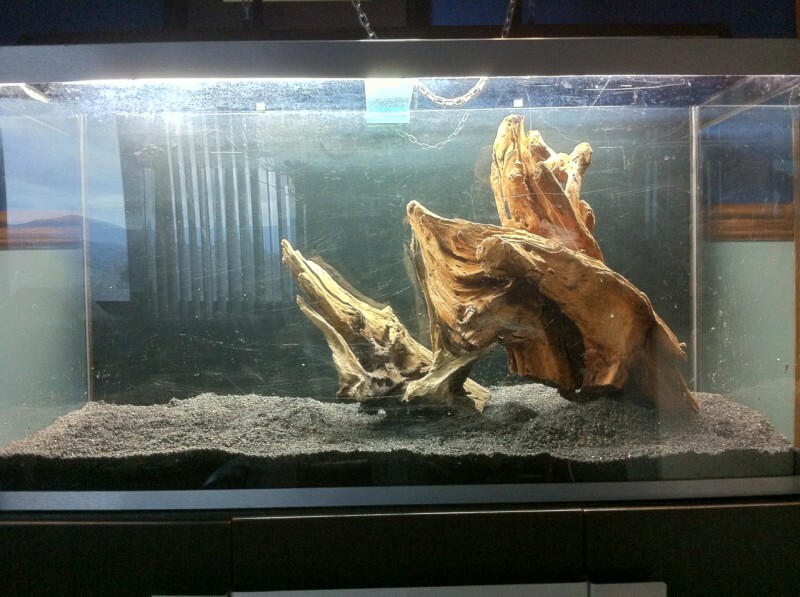 After finding a stellar deal on a 84 Gallon Fluval Osaka 320 I decided to start a new project. 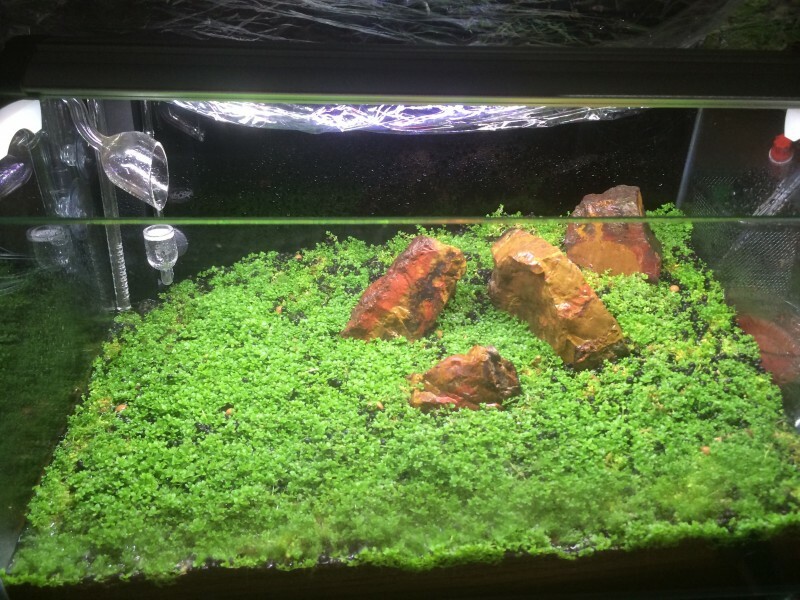 Sadly the tank has a bunch of small scratches that I dint notice until after I had the tank (thats what happens when you buy a tank from photos…at least they arnt to noticeable once it filled with water. 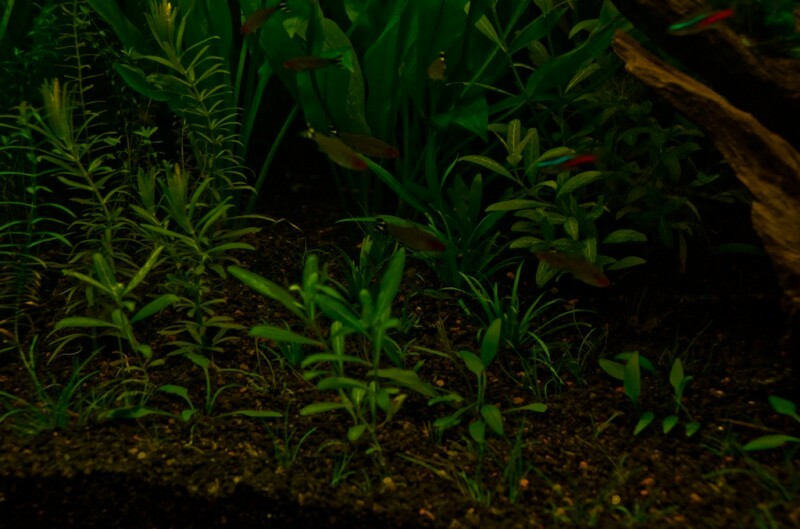 I have never been a fan of the generic pet shop backgrounds so once the tank showed up I decided to spray paint the background to make a nice clean backdrop. 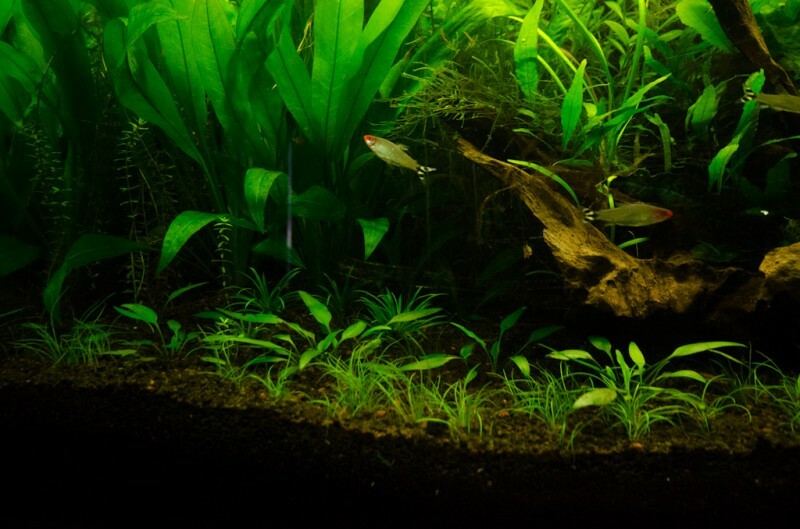 A black background will make your plants and fish pop and is always a good choice. 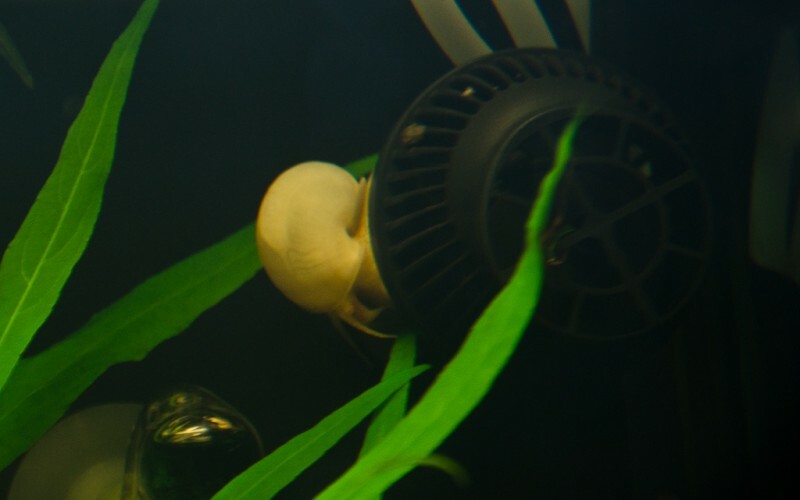 Start by giving the back of the tank a good cleaning. 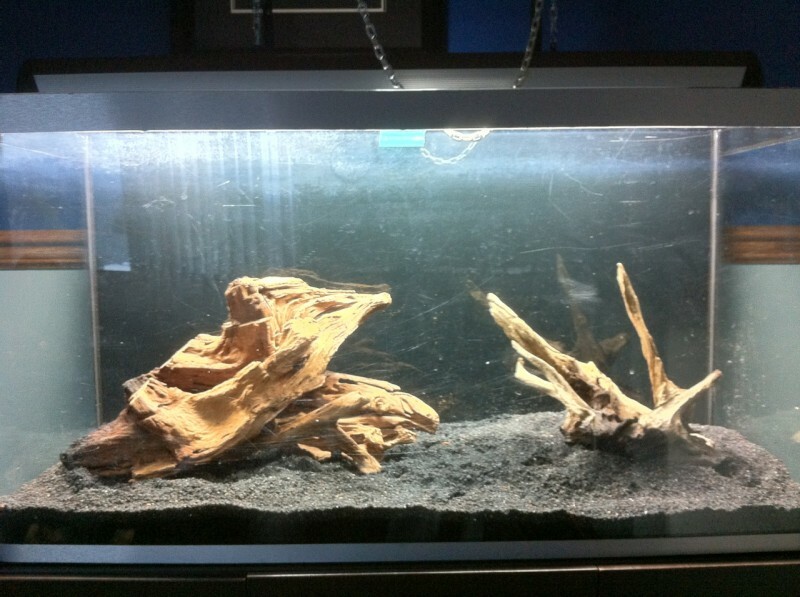 Make sure there is no oil or dirt on the tank before you paint it. 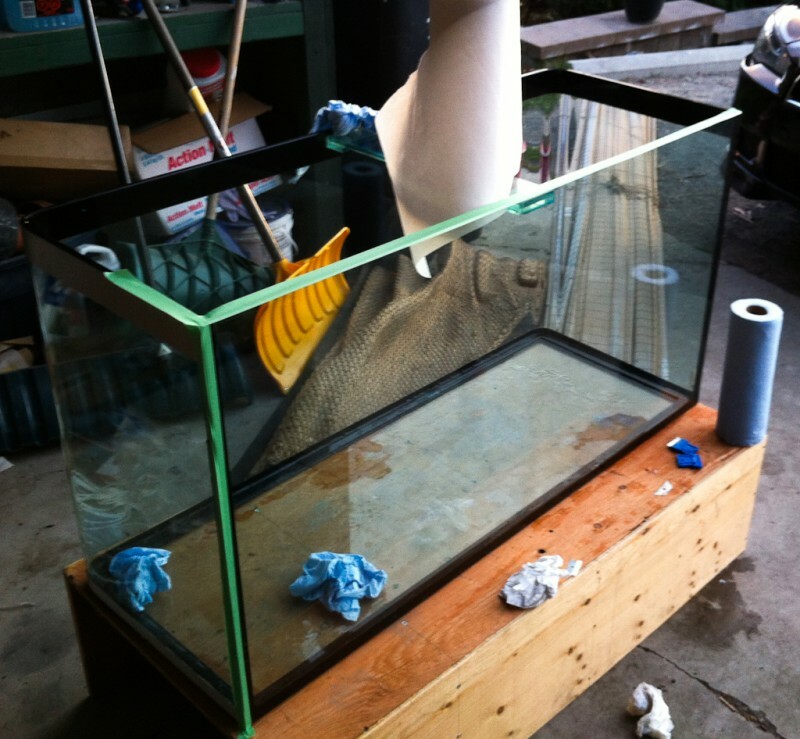 Mask/tape off absolutely every side of the tank to prevent any over spray hitting the viewing area. A little work now will save you alot of clean up later. 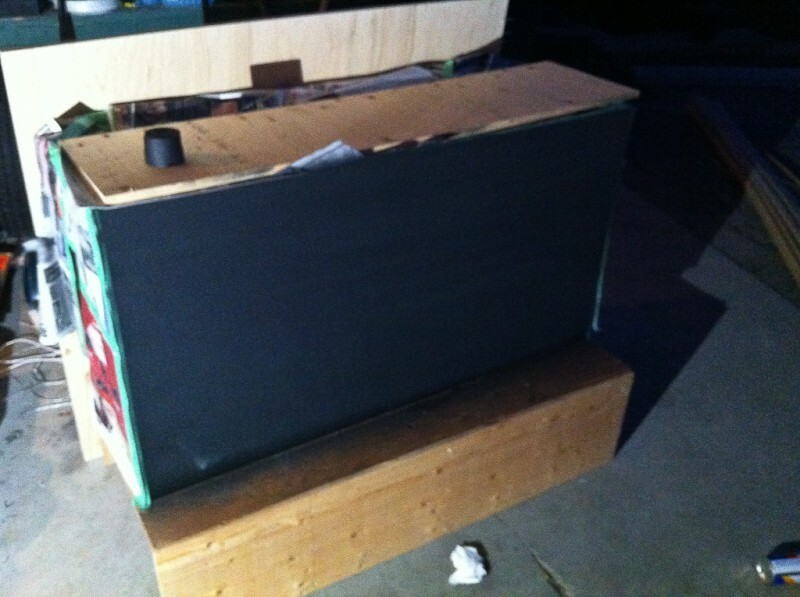 Spray paint the back using a flat black paint. Do multiple light coats to prevent runs and create a seamless backdrop. 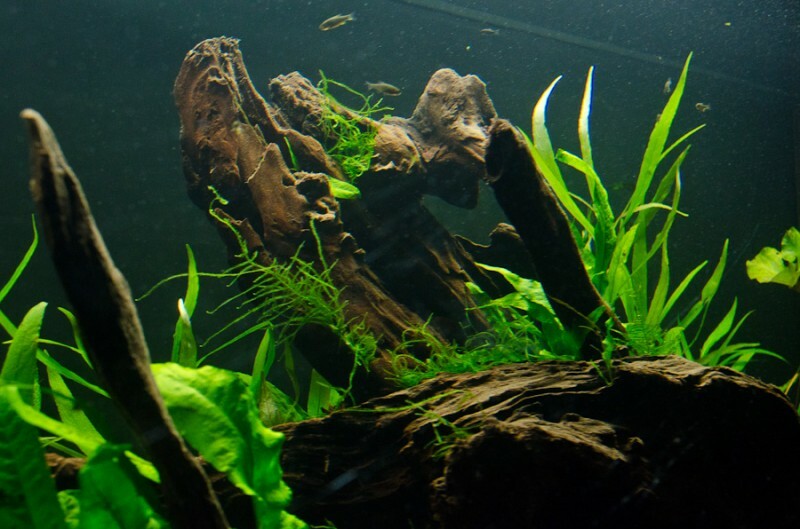 The filter for this tank is an FX5.. argueably a little overkill but you can not over filter a tank.. My only worry is to much flow as the tank will be stocked with armys of tetras and danios. 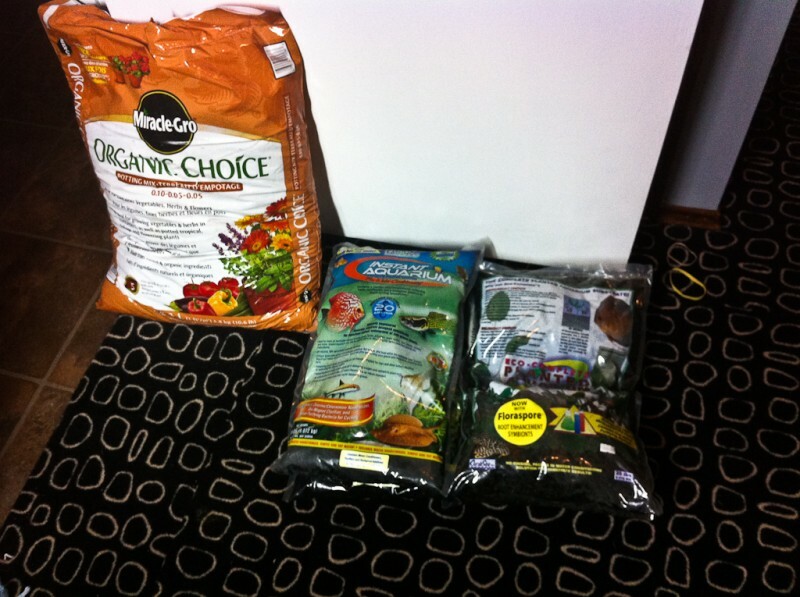 Since this will be a planted dirt tank.. i decided to go with good old Miracle Grow Organic Choice Potting Mix capped with Eco-Complete. 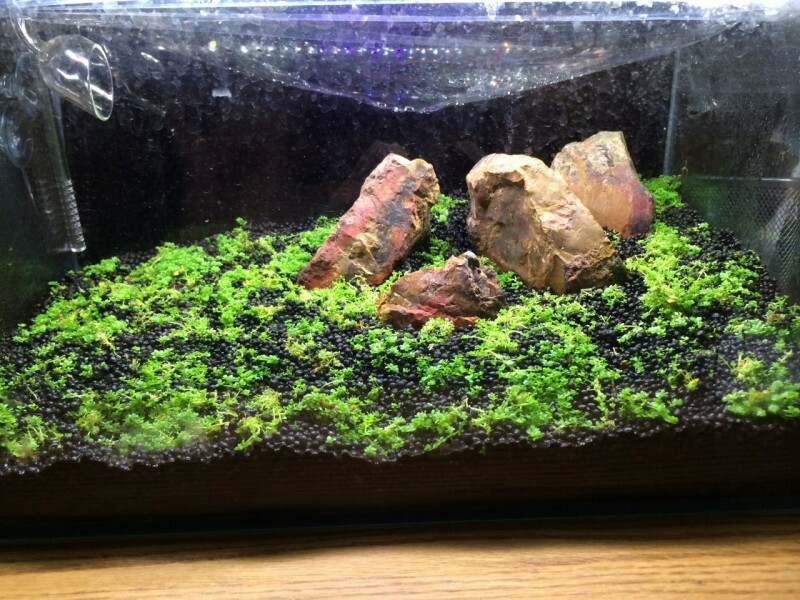 I also used some Instant Aquaria to cap the the dirt as the price was right! 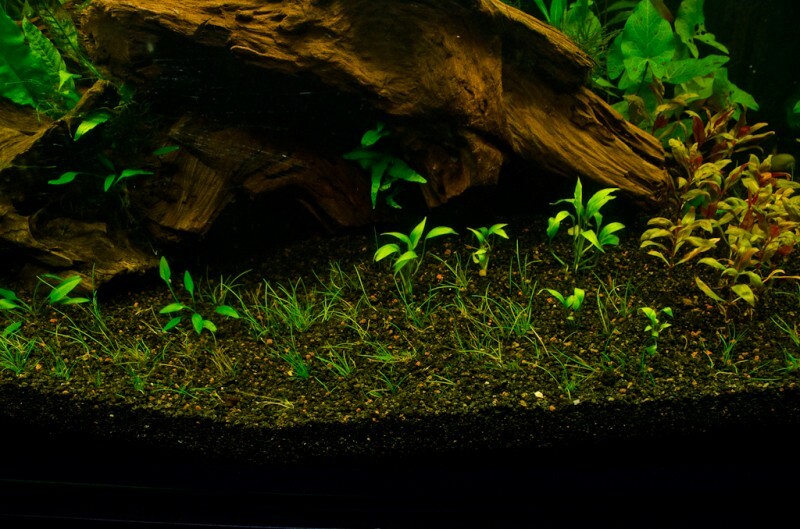 Using eco-complete i create a esthetic border to hide the dirt (unlike my first planted tank where you can see the layers). 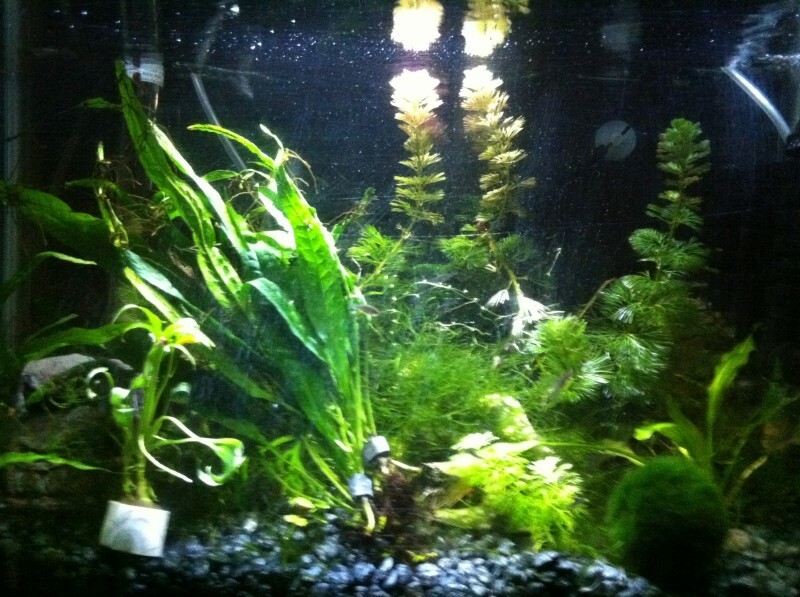 Once I had my base I capped with with instant aquaria and eco-complete. 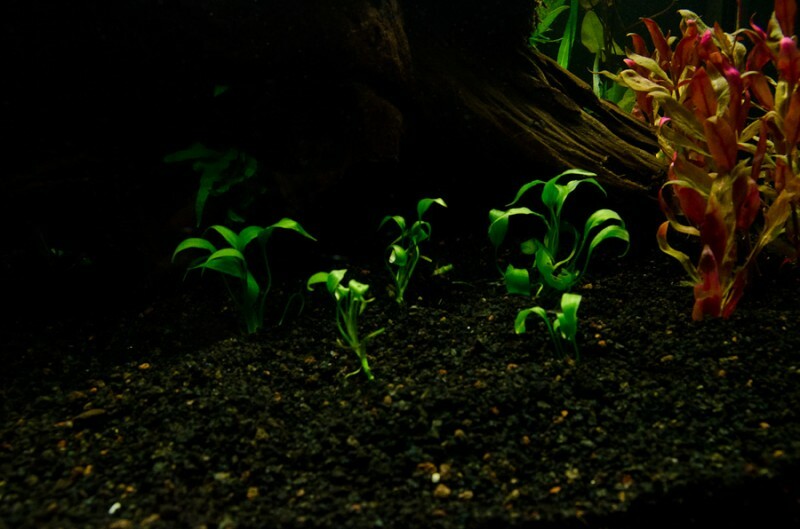 Once the driftwood was prepared (quit floating) I decided to play with some scapes in the tank. So far this seems to be my favorite layout.. 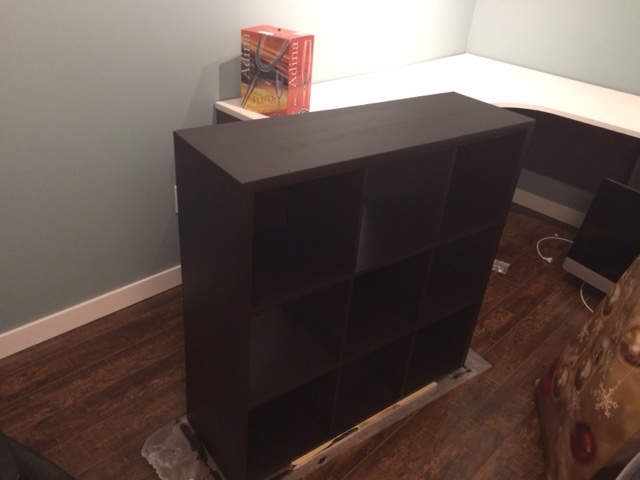 I think it will look even better once i build up the left/right sides and have a valley in the center…. The waiting games is killing me! (hurry up eco-complete order!) 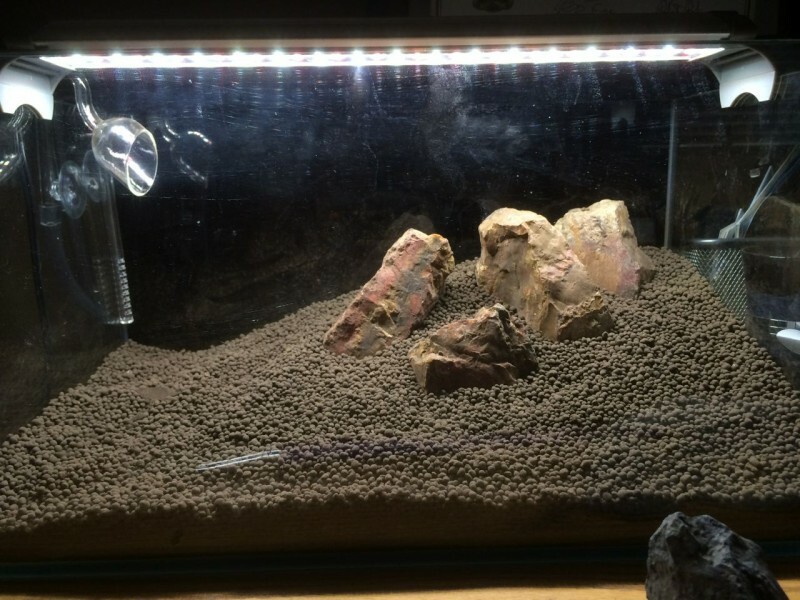 I decided to DIY Night Light Aquarium leds. which turned out great. So far i’m loving the aqua color on the tank. 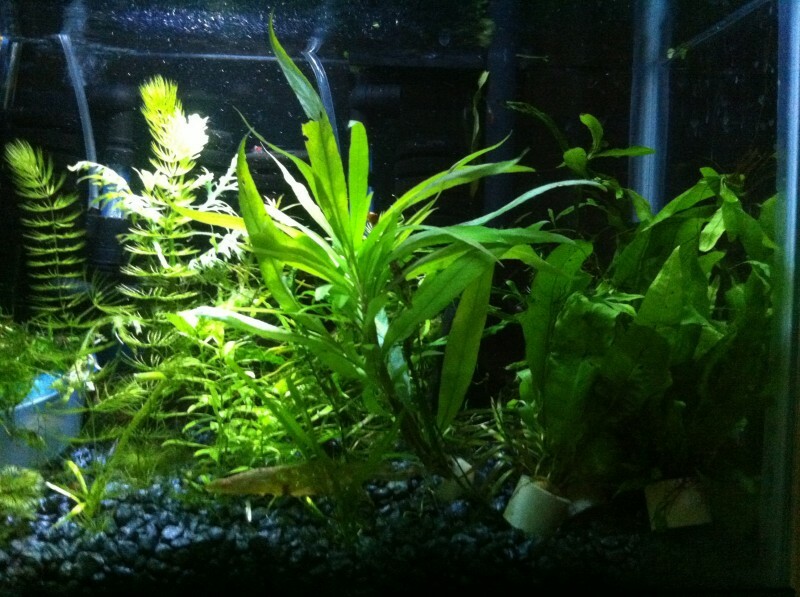 Over the past week or two I have been stocking up on plants which are currently housed in my shrimp/fry tanks. 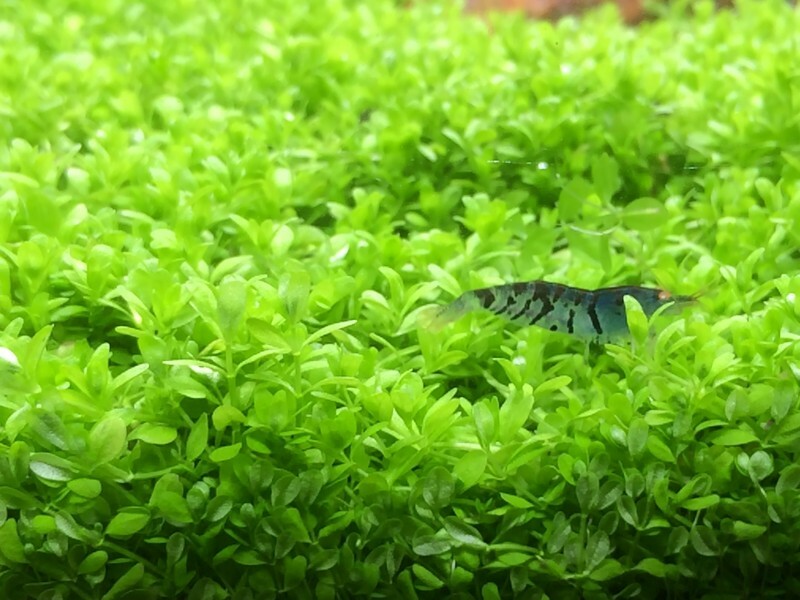 The shrimp seem to love snacking on the algae and micro organisms on the fresh plants. 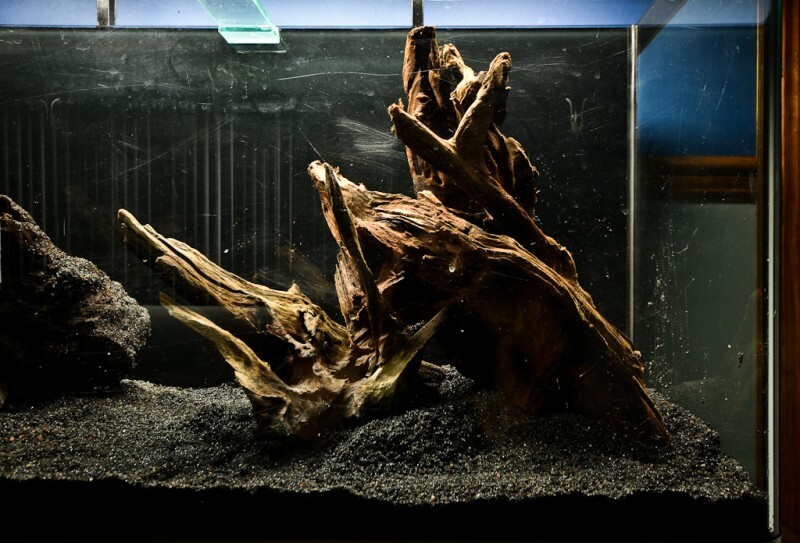 WHen it comes to drift wood a small rotation can totaly change the look of the aquascape. I must have tried 30 different varations until i decided which way to go. 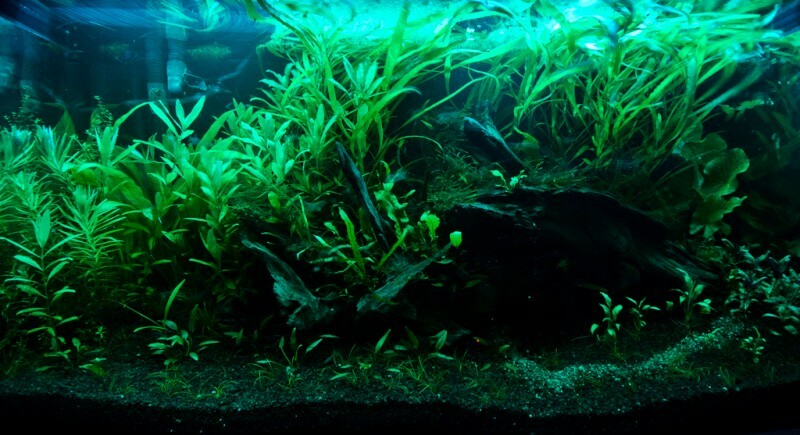 I would advise that you leave the tank water less for a few days to give you time to play with different scapes. 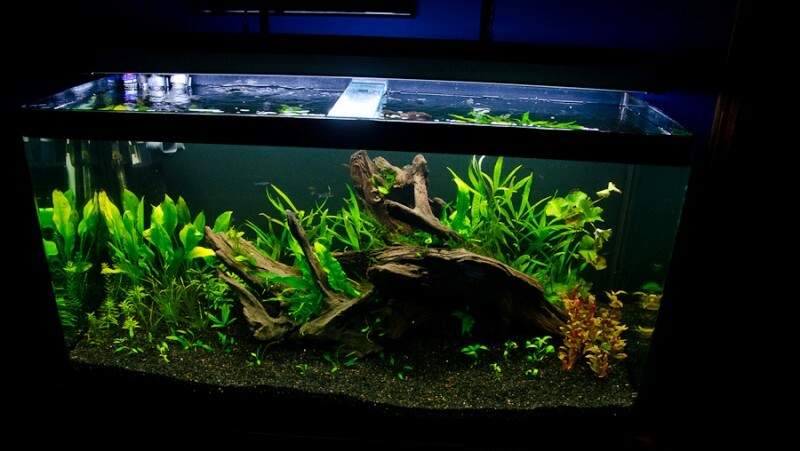 Its much harder to change once filled so be patient and find the best layout possible. Below are a few (of many) examples of different looks with just 2 pieces of drift wood. 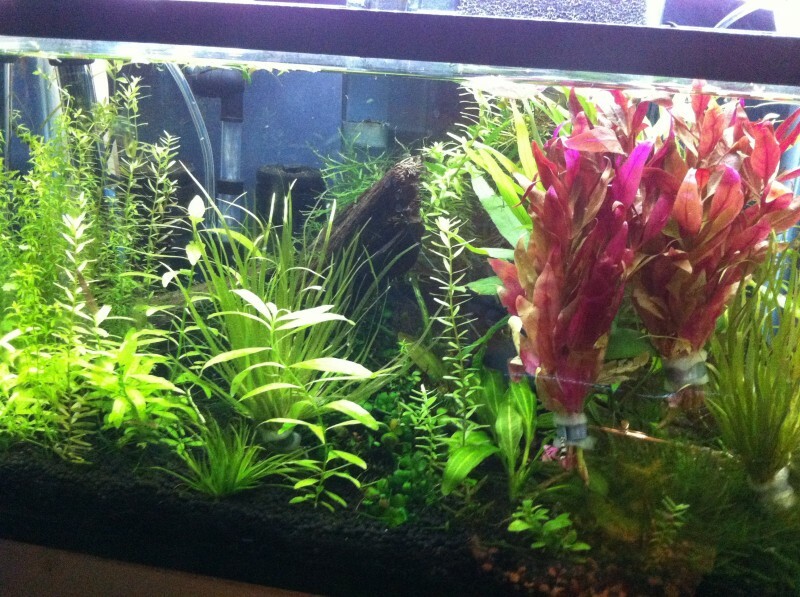 Next you want to half fill the tank with water and start planting! 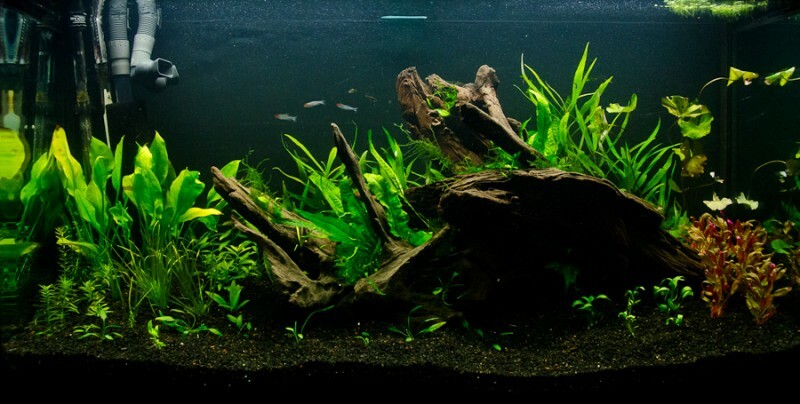 Its always best to you tall stems/plants as your “background, and work forward to medium mid ground plants then finally low lying front plants or carpets. 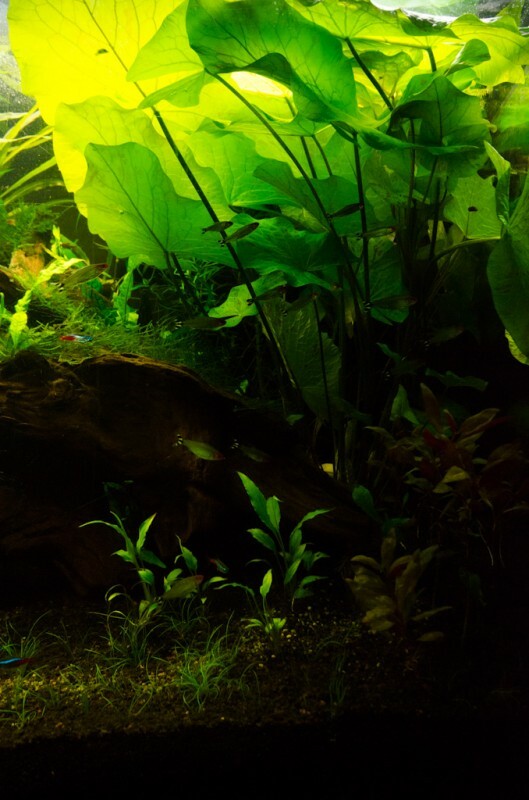 If you know the proper name of the plant you should be able to find out its lighting requirements, co2 needs and maximum growth height. 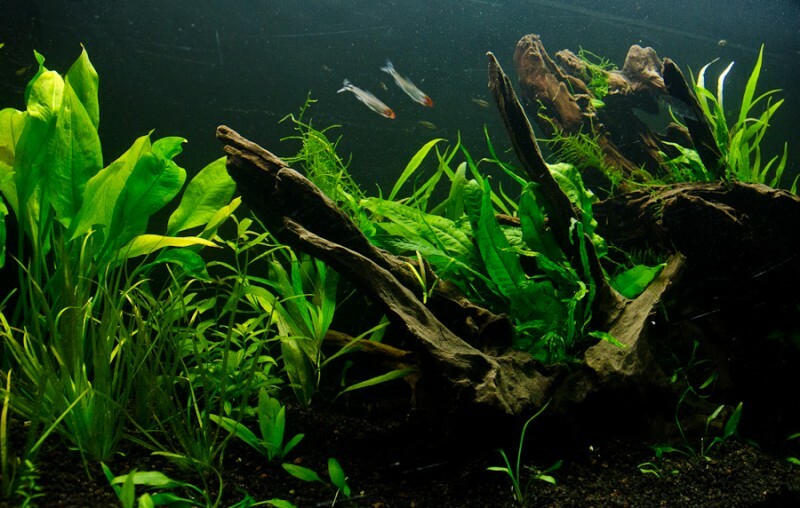 Be sure to plan for future growth to avoid replanting later. Night shot with only the LED’s on. Its been about 6 weeks and time for an update. 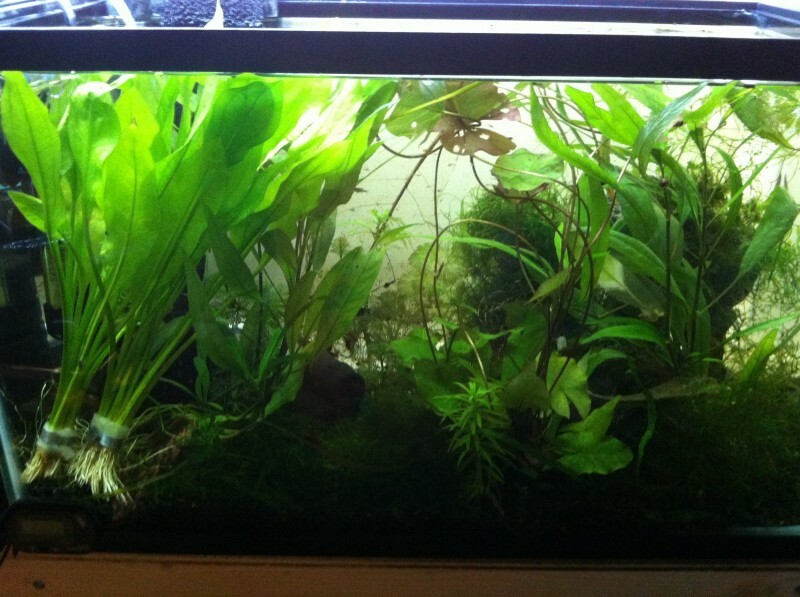 The plants have really started to grow in, especially the hyghro along the back.. i have trimmed it a few times now. 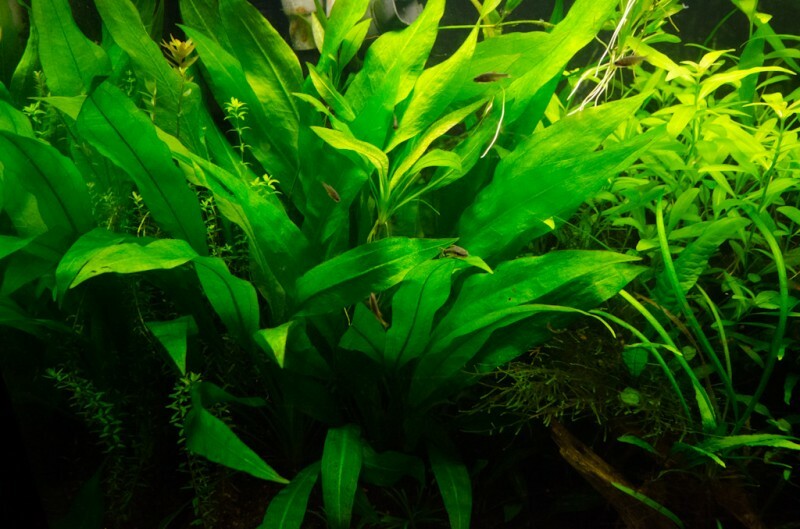 A few of the plans such as the tall spiky ones in the bottom left has dropped their old leaves and grown new ones , the lots/Lilly have done lost most of their original steam and are being replaced with a healthy new batch. 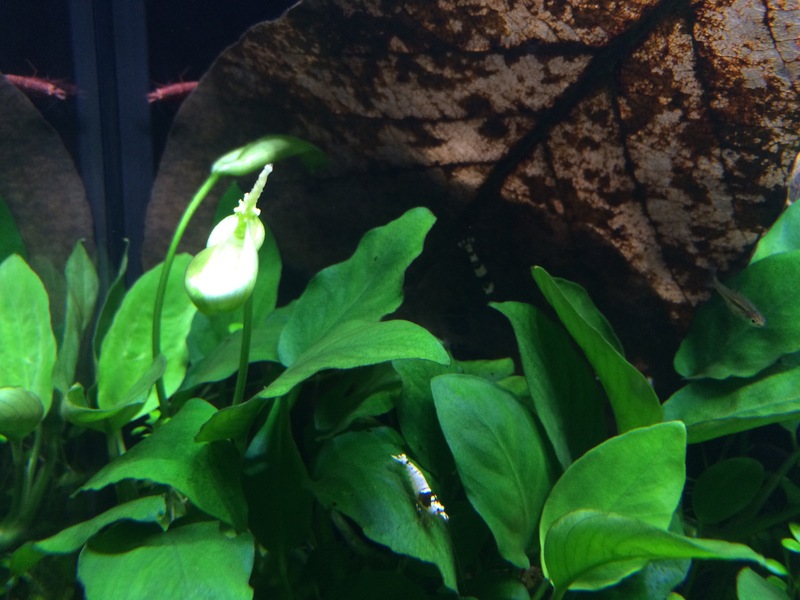 This is common as a plant adjust to its new environment. 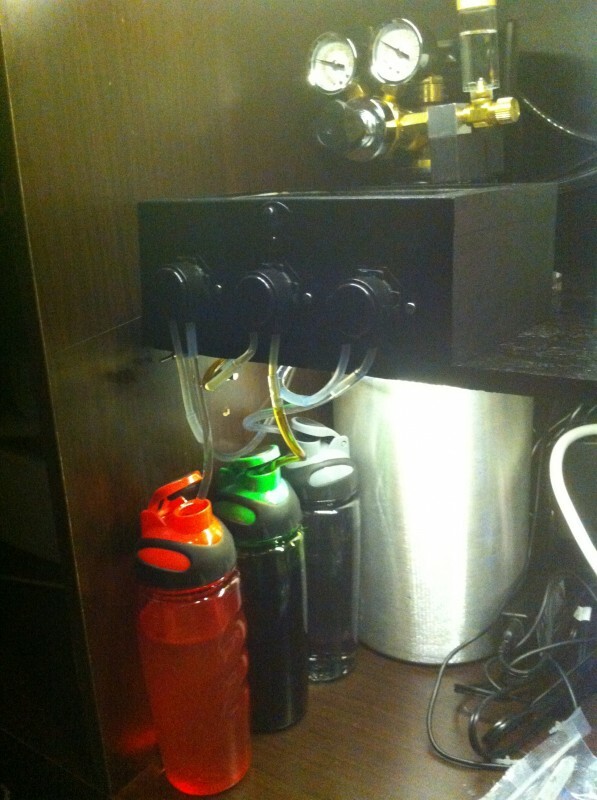 I have also added Pressurized CO2 and built an automatic dosing system. Wow.. .. 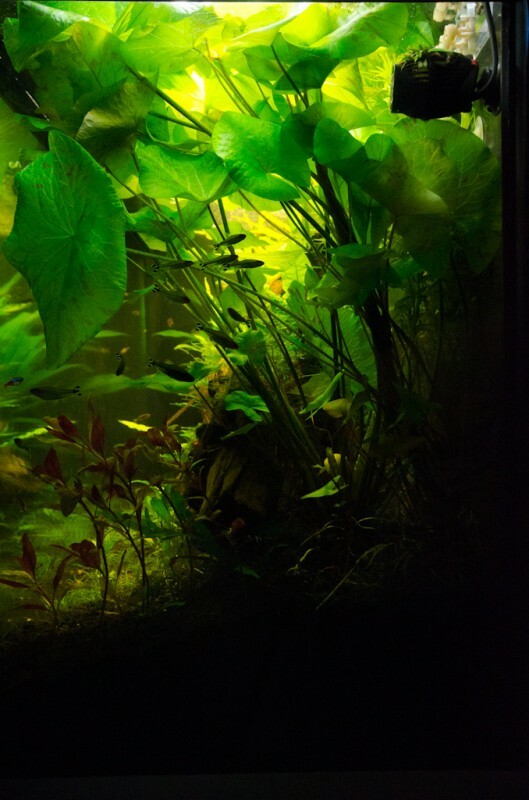 I just realized that I have only had this tank up and running for about a month and a half now.. it feels like much longer! Not to shabby for 47 days in. .. 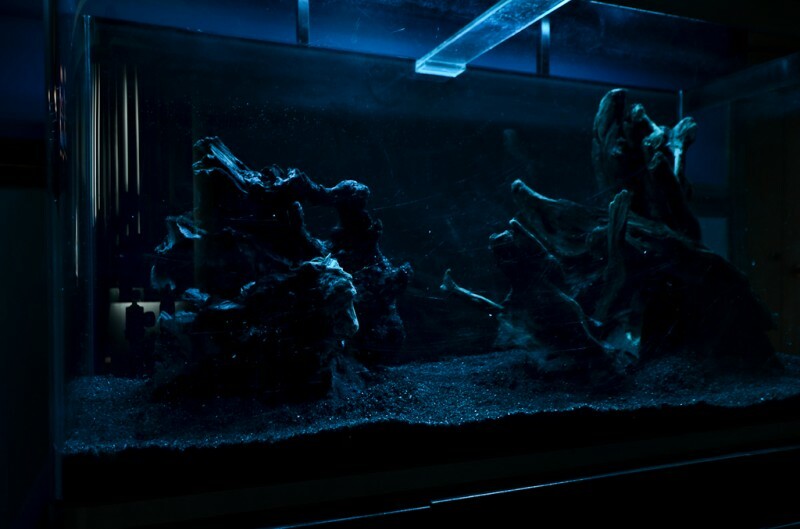 I cant wait to see what this tank turns into over time. 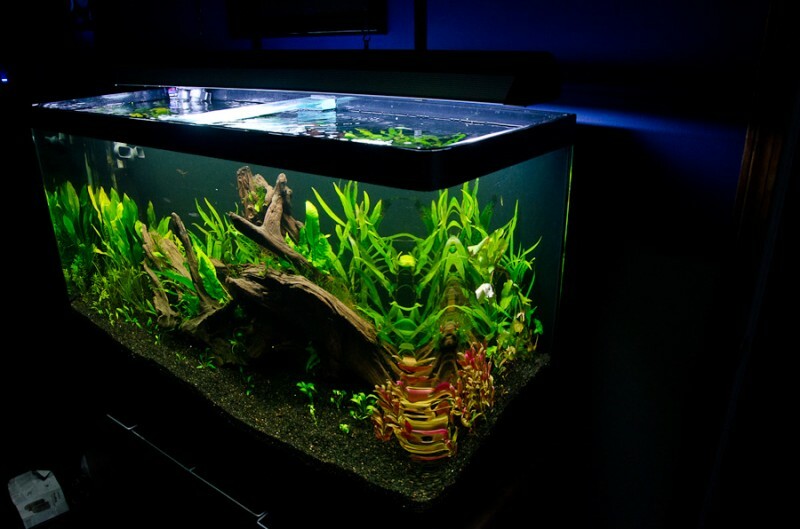 I was also inspired but another member to shoot a quick underwater video and give you guys a fish eye view of the tank. I finally got a proper tube holder! I also wanted to take a night show was the lovely led night lighting. 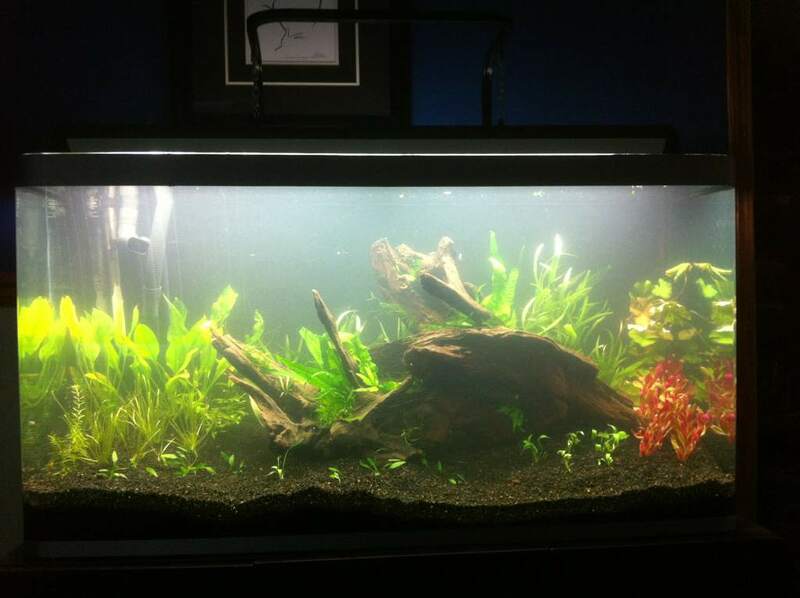 The tank has really filled in the past few weeks. I even trimmed it twice in the past month. 31/07/2013 – Time for an update! 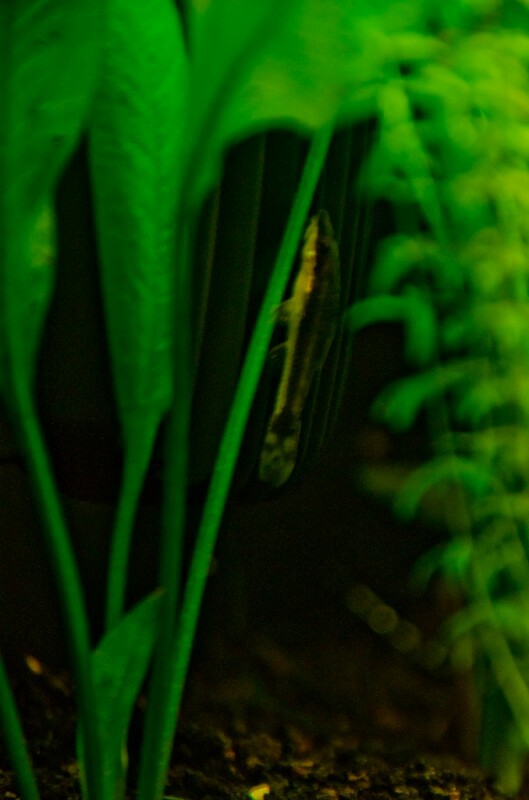 The amazon sword nicely hides everything as it has taken over the left hand side of the tank. There is also a stem full of “runners” and mini swords popping up. 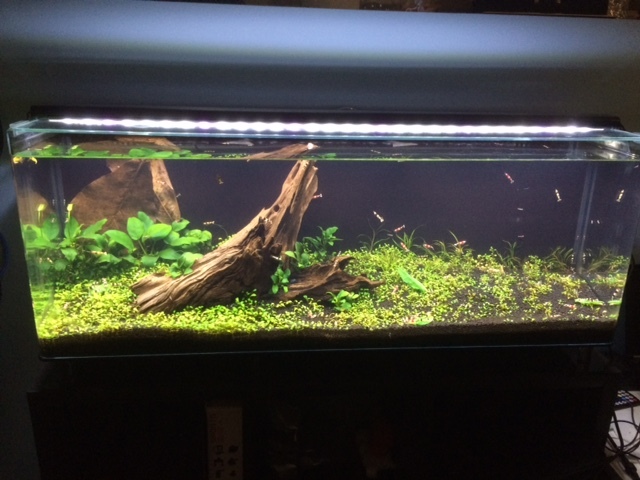 I may move some into other tanks.. or sell a few. 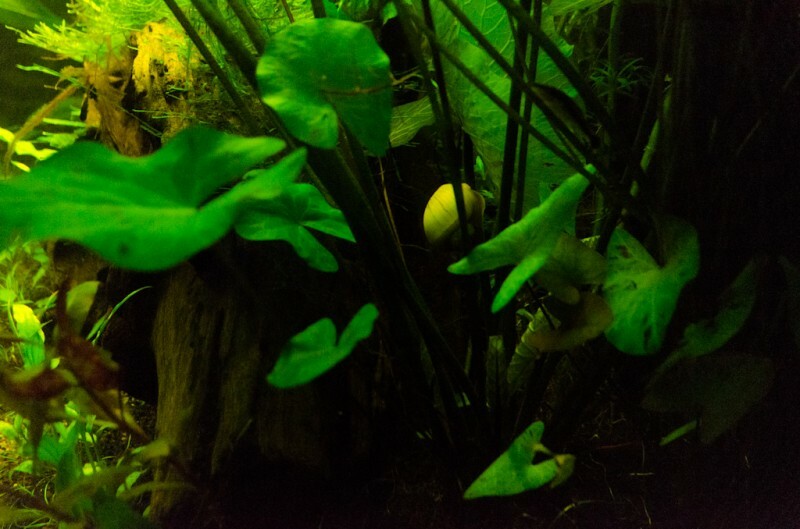 The Lilly pads are massive and shading the right hand side, these will also need trimming as the huge shadow has started to kill my red plants.. 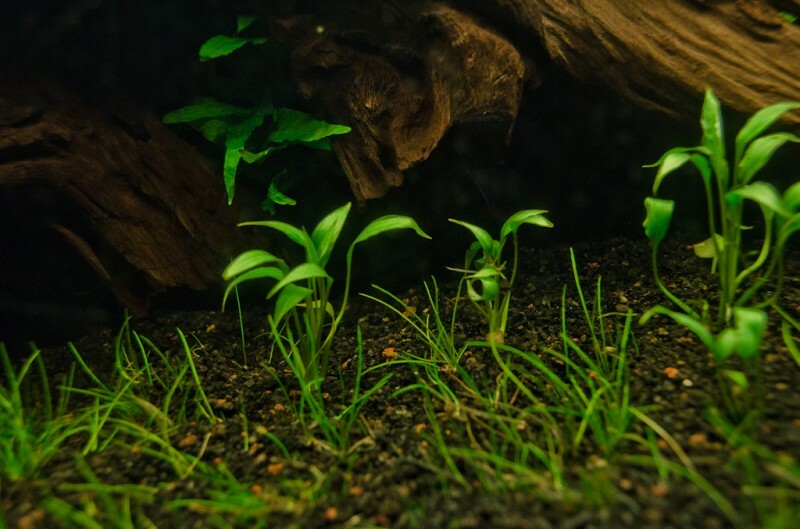 The only thing not growing like the weed is the dwarf hair grass.. i’m not to sure why.. any ideas? 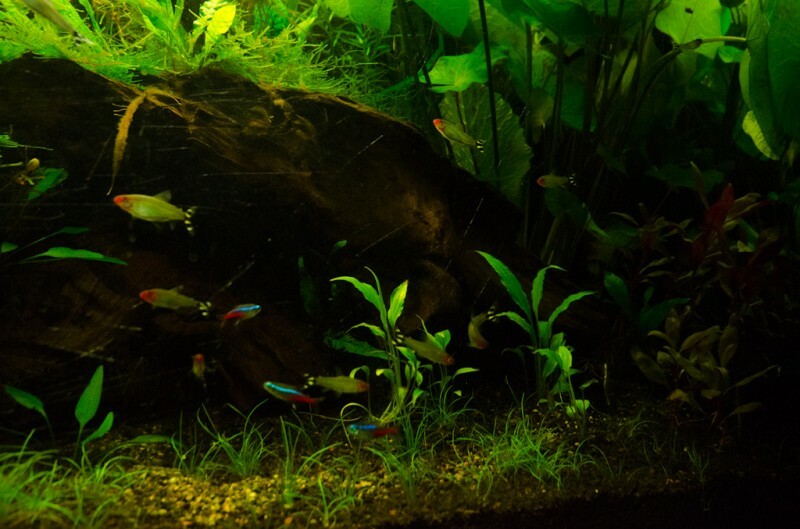 Led’s make great night lights, especially in an aquarium! The T5HO lights were a little bright for watching movies at night so i decided to dim down night mode using leds. 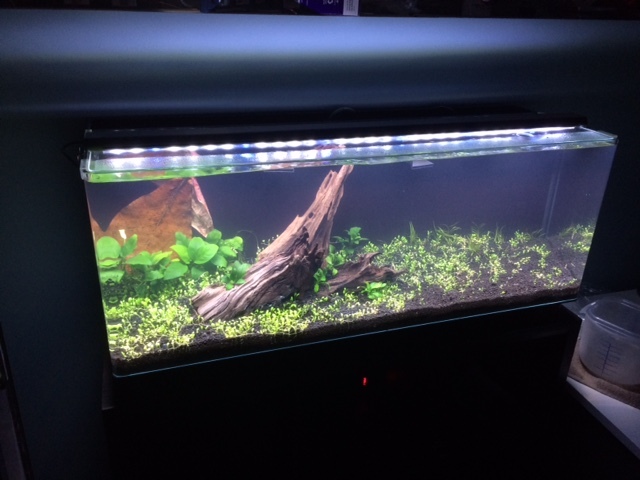 For this project i decided to use a strip of RGB leds so i could pick custom colors and fine tune the look of this tank. 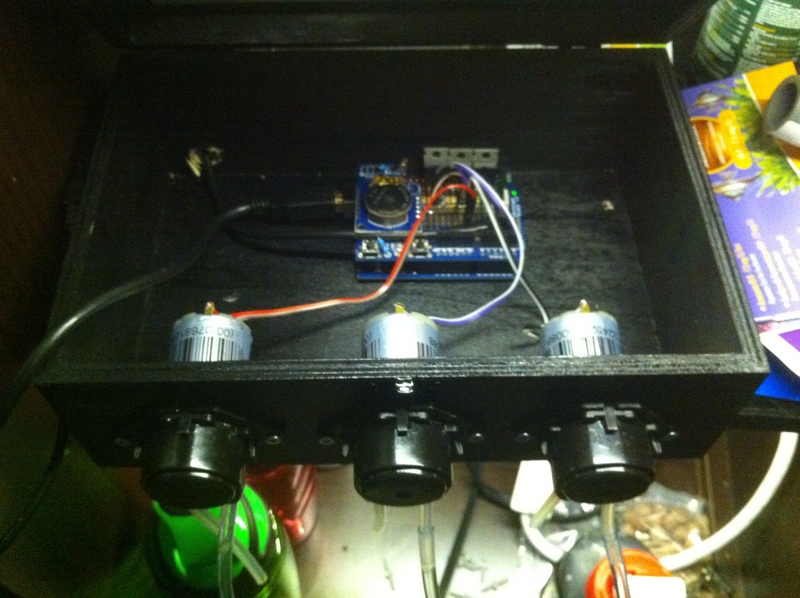 I found a 75′ roll of black thermostat control wire for 3$ at princess auto which was just about perfect for making my led power wire. 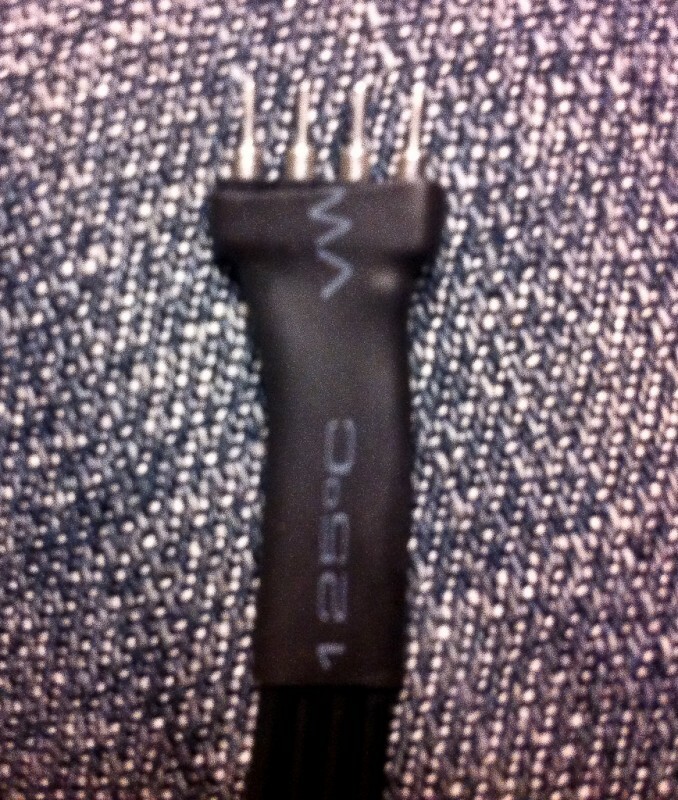 The only down fall was the wire was 3 wire.. so i added a 4th strand and use small chucks of heat shrink to a single 4 wire cable. 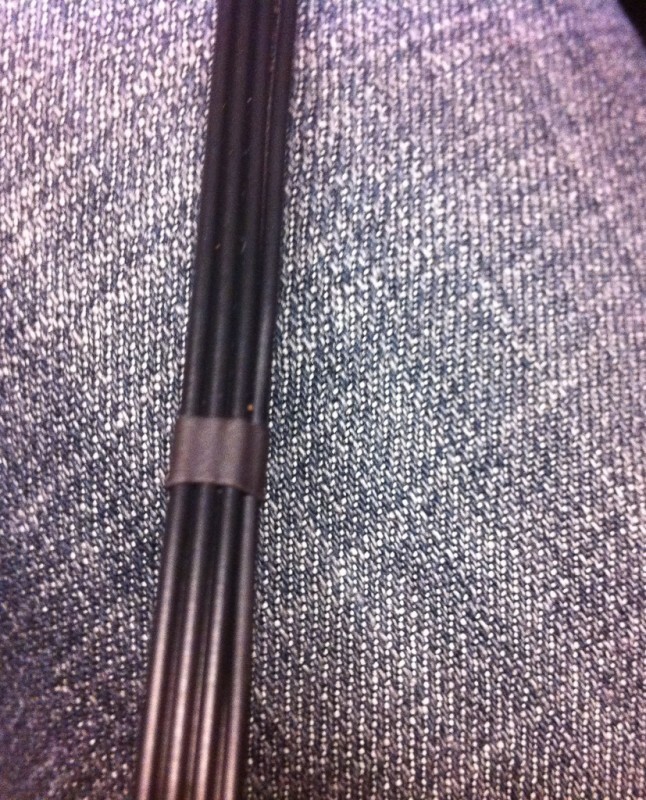 heat shrink became a very clean way to join the wires for the RGB Leds. 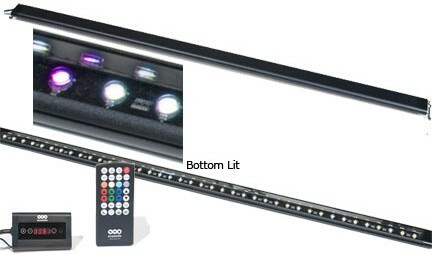 The RGB leds have 3m double sided tape as a backing that made it a breeze to stock to the T5HO fixture. 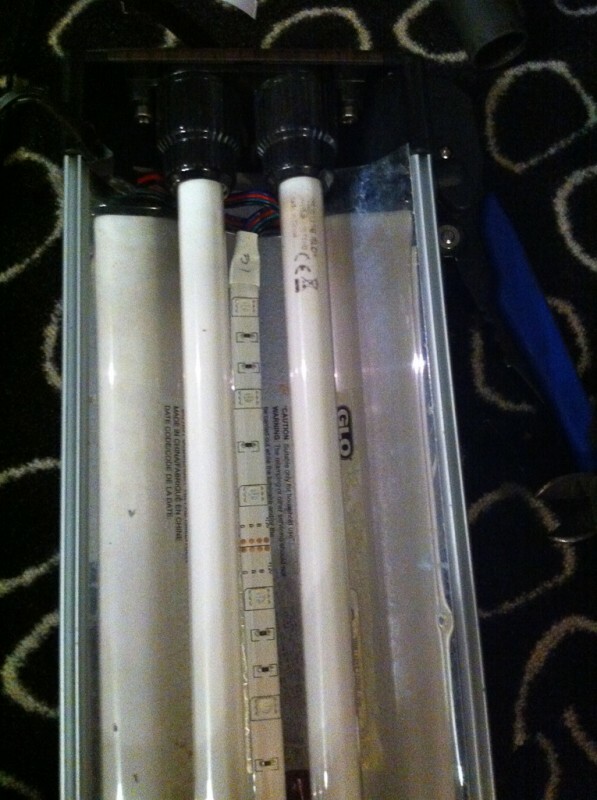 My only worry is if the heat from the T5’s will loosen the led sticker or not.. but time will tell! 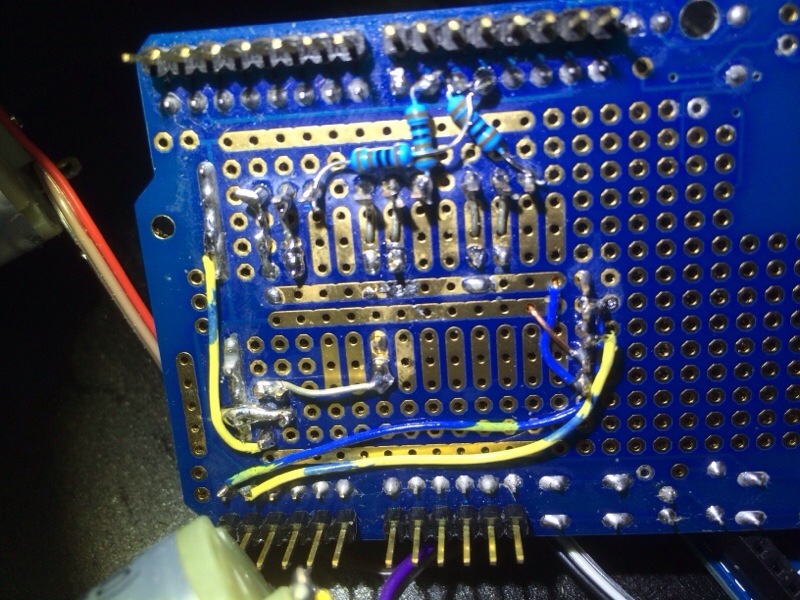 A simple RGB controller let you pick the perfect color. You can pick your color, fading effects, brightness and speed. 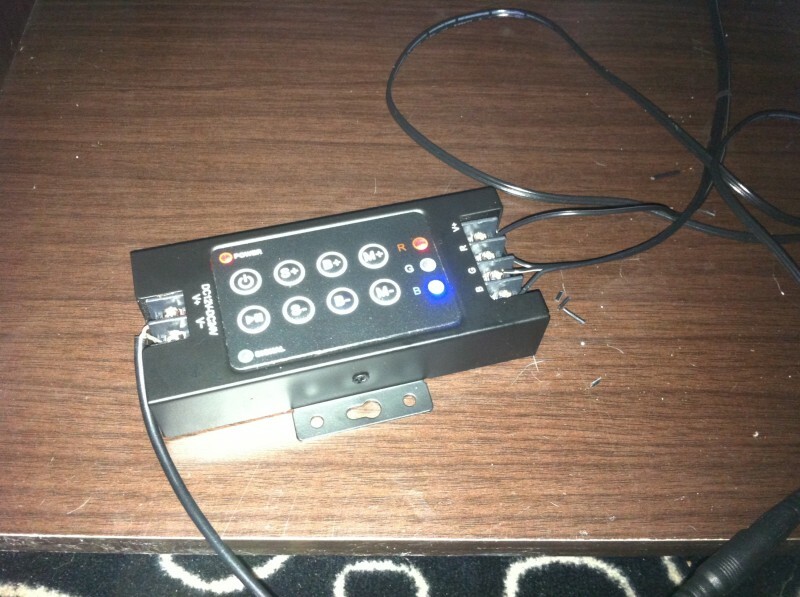 I got this controller fairly cheap off ebay and it works perfectly. 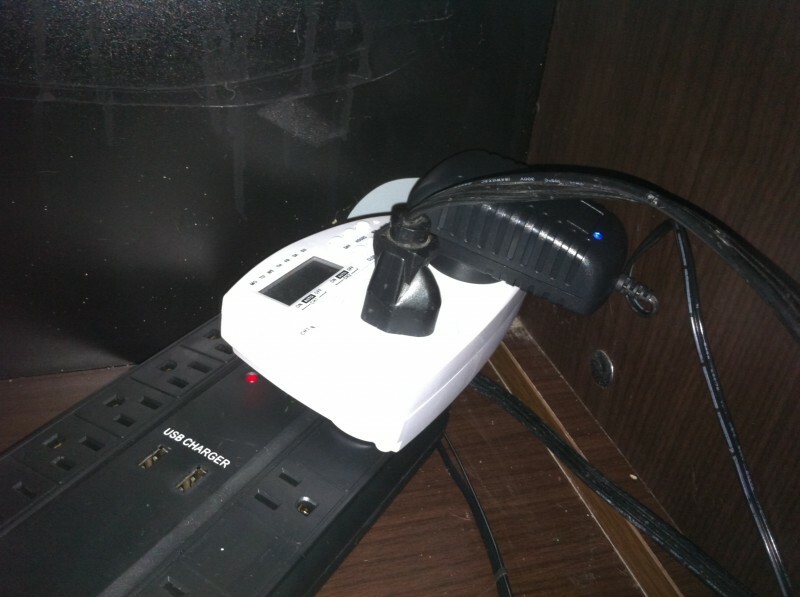 The power bar i used also has usb ports that will power a future arduino aquarium controller project. 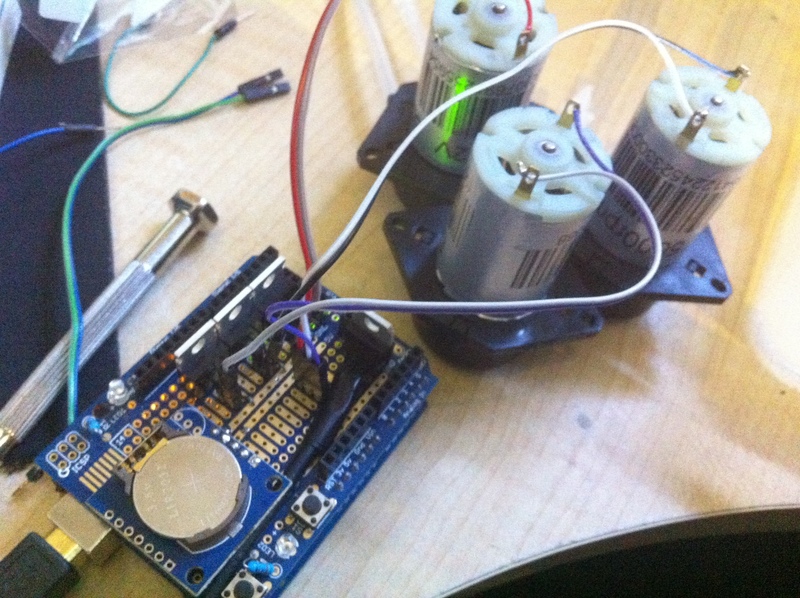 Time for a test.. and it works! 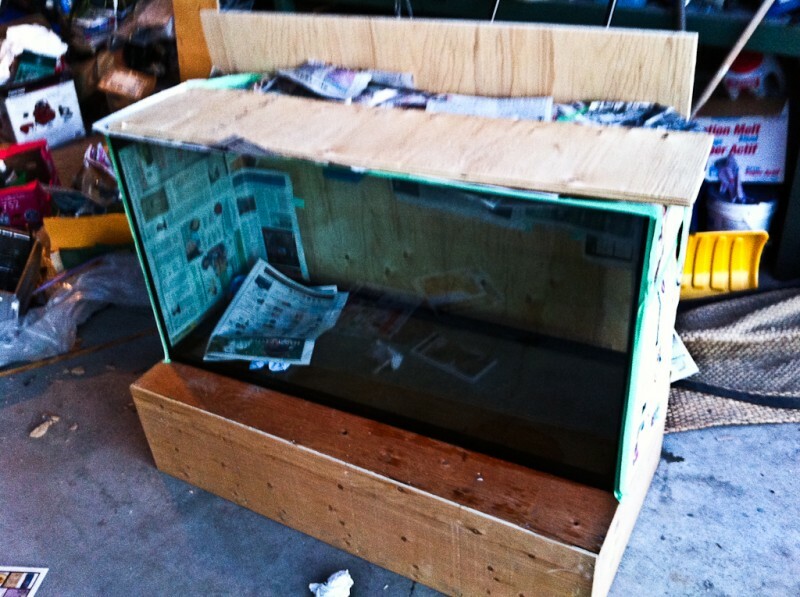 So far the Aqua blue color is my favorite and will look great once the tank is filled. 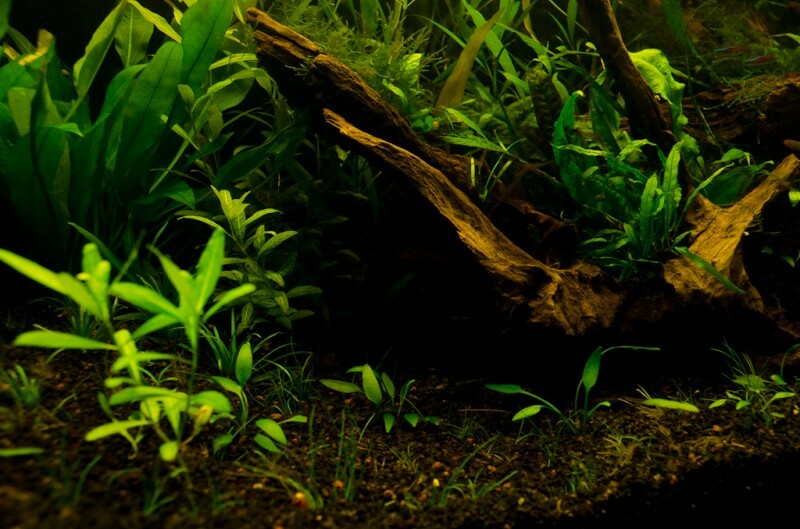 Test with the tank full of water and plants.. It looks awesome! 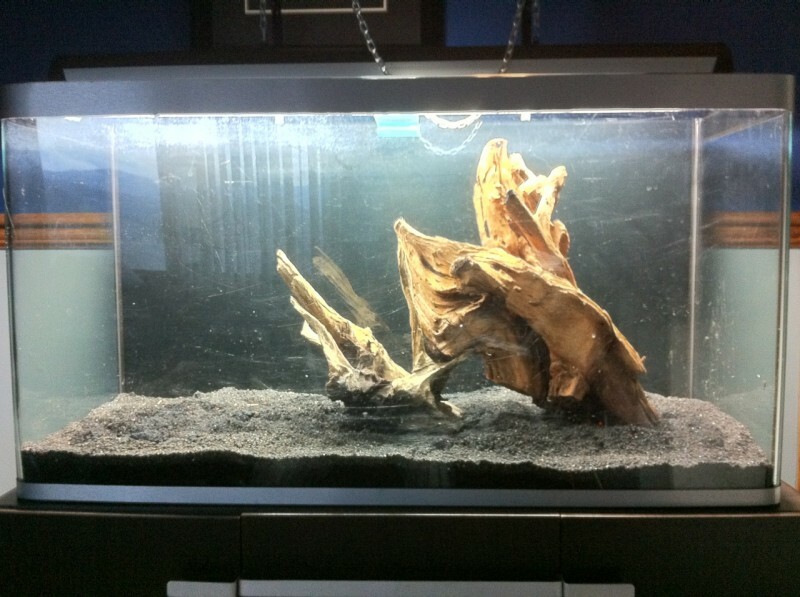 Finding interesting pieces of driftwood can help create a stunning under water aqua scape. The first thing you will need to do is find some interesting wood. 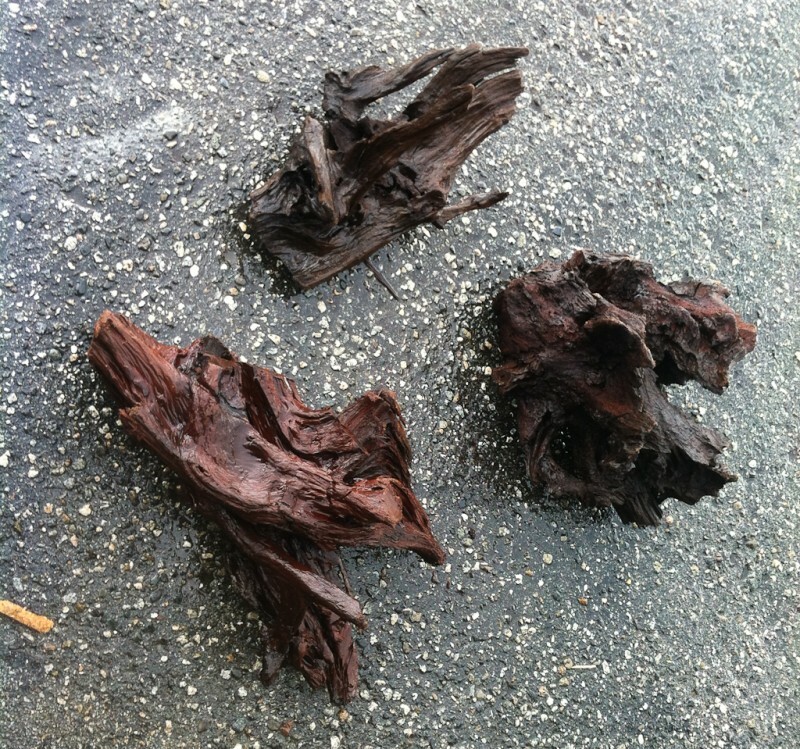 Drift wood can be picked up from a local pet store or scavenged from local oceans or streams. 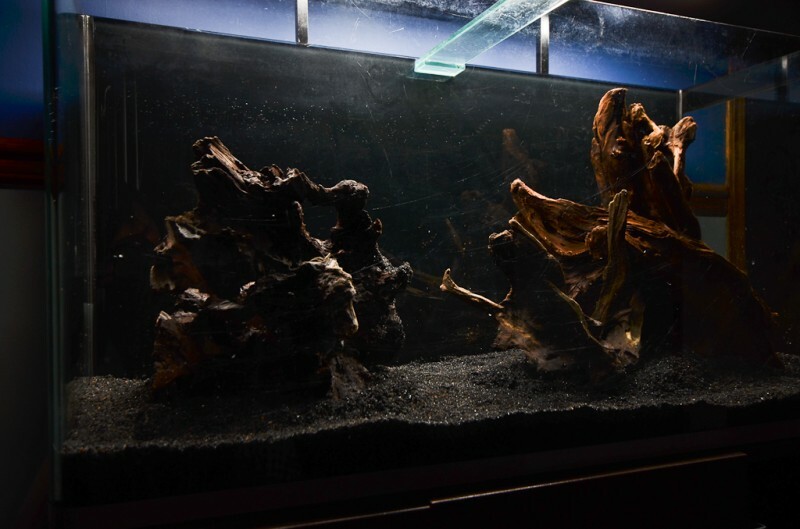 If you are driftwood hunting in nature be sure your wood is a hardwood as softwoods such as pine will decompose far to quickly in the aquarium and create a hazardous environment for your fish. 1. Using a pressure washer or a scrub brush remove all dirt and bark from your wood. 2. 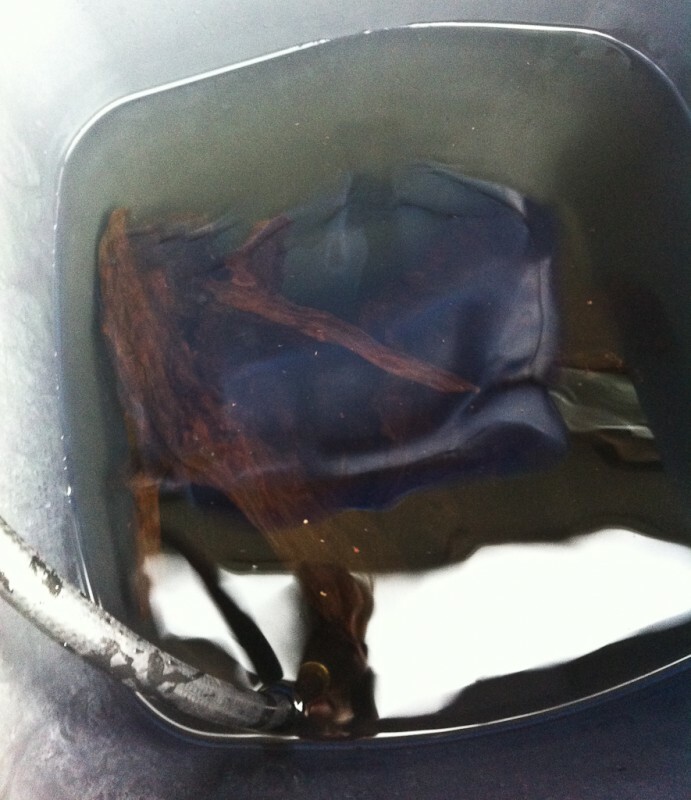 If possible boil your driftwood in a large pot, bathtub or bucket. this will help release tannons and kill any potential hitchhiking creatures. 3. 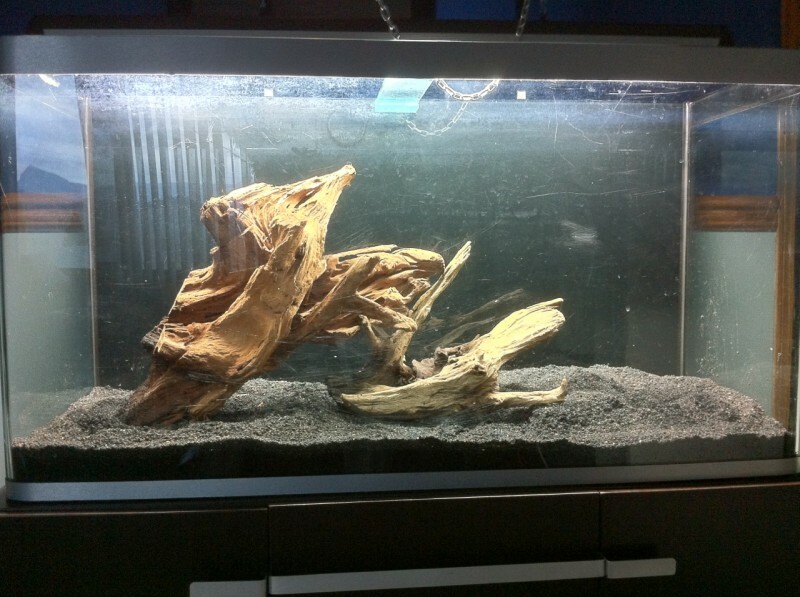 If your driftwood is floating, you may have to let it site for a few days up to a month until it finally decides to sink.. 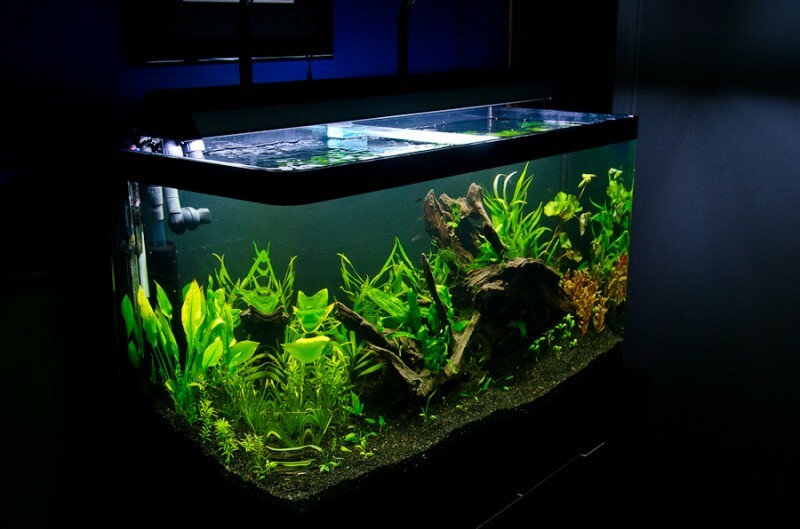 In my experience most peices have sunk within 3-4 days of soaking. 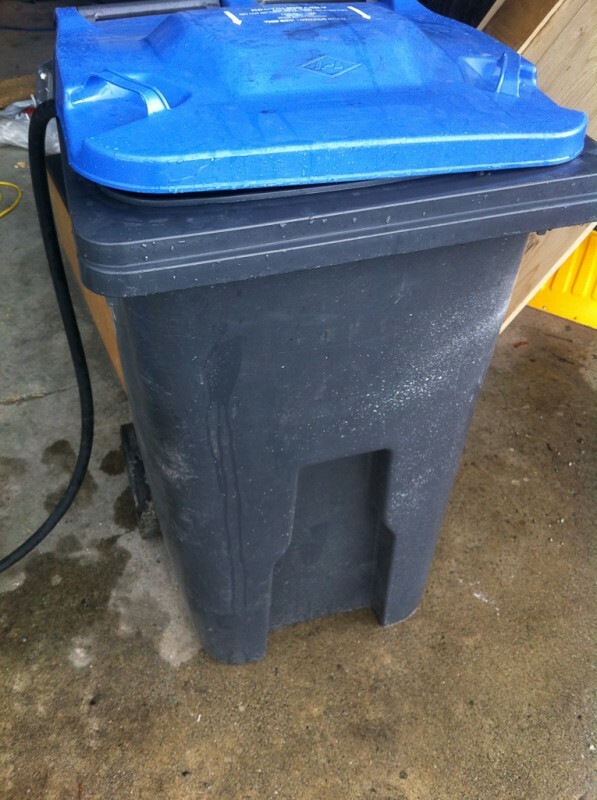 Large garbage or recycling cans make excellent soaking containers, just be sure to give it a good rinse first! I soaked my wood for about 5 days. 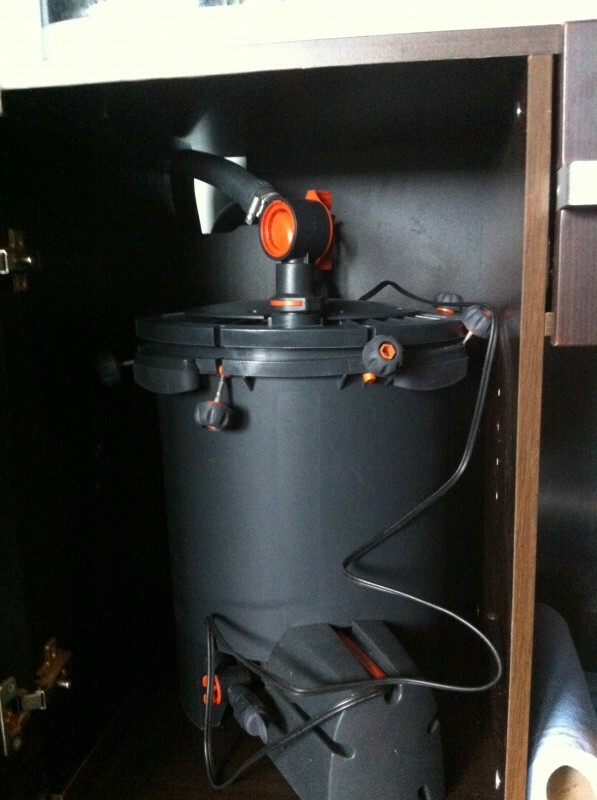 Each day I would dump out and fill the bin with fresh water to help release the tannins (tea color in the water). 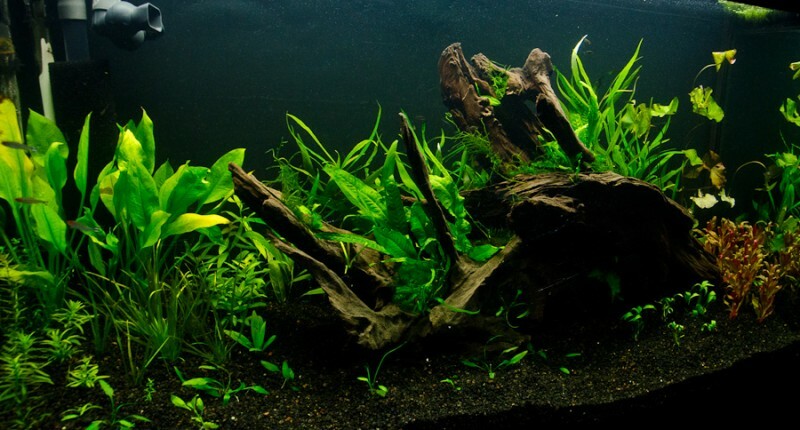 The tannins will not hurt the fish (in fact it may even be beneficial to most fish) Removing tannins is mainly an ascetic choice and is personal preference. Tannins generally fully leach out after about 3 months. 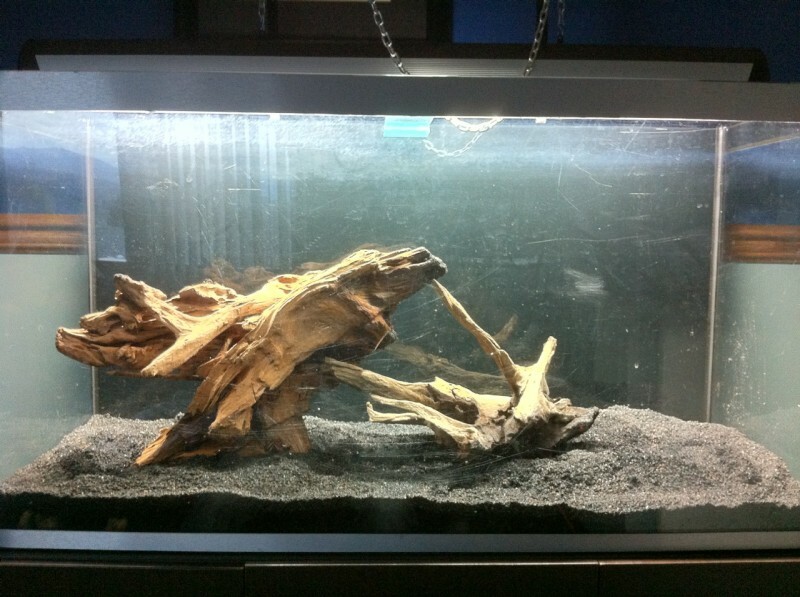 Once your driftwood is fully water logged its time to place it in your tank and decide on a lay out! Be sure to rotate it and try every possible angle until you get it just right. You can also stack multiple possible small pieces togeaterh to create interesting larger pieces. 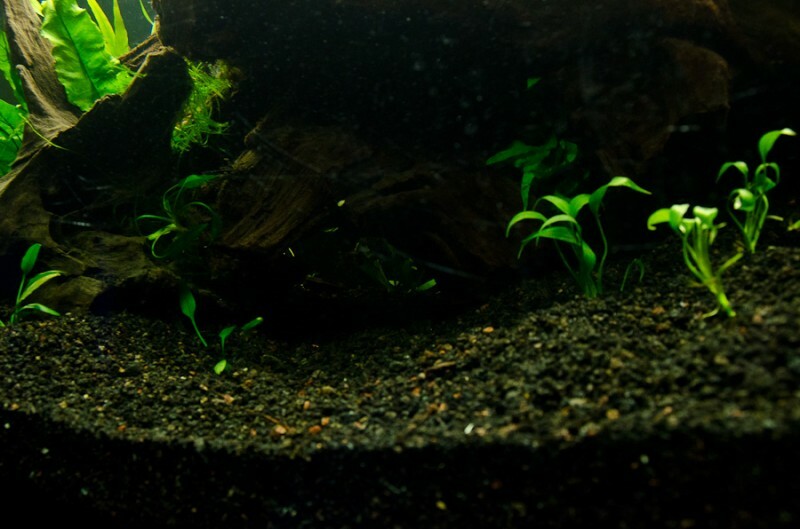 All great planted tanks start with the right substrate. 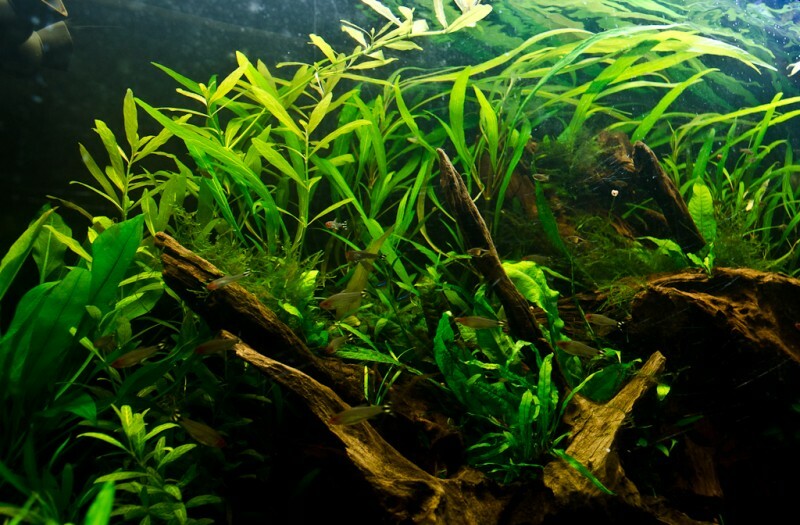 In a high tech tank one generally injects C02 and add nutrients to through root tabs or liquid fertilizers. 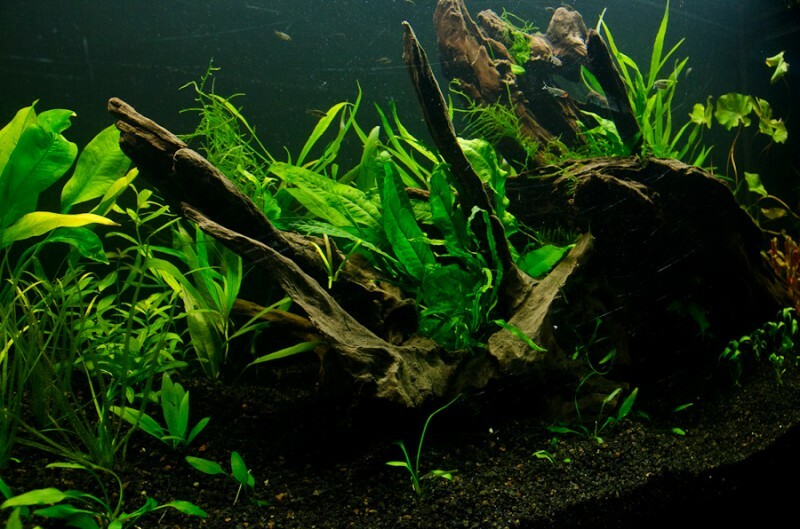 In a low tech tank one uses dirt as a sources of nutrients for plant growth. 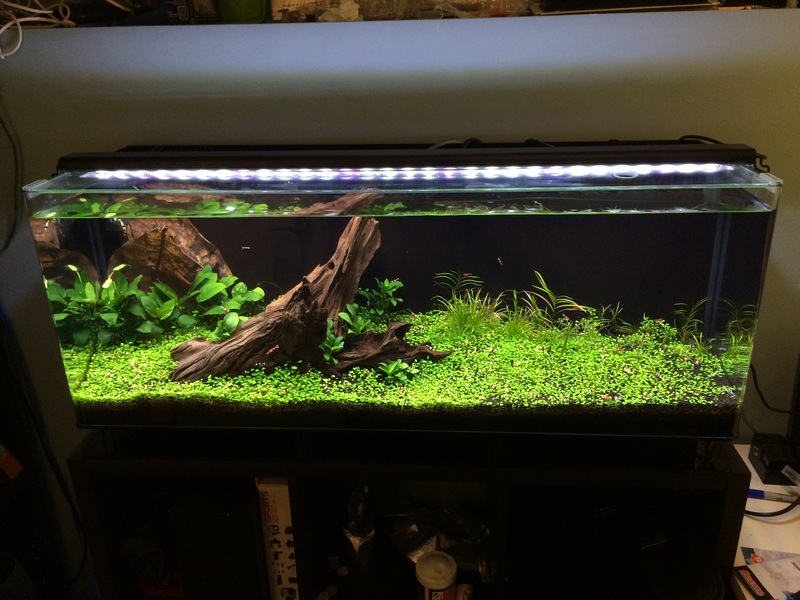 I am a fan of low tech as it reduces the added work of daily or weekly doing of ferts. 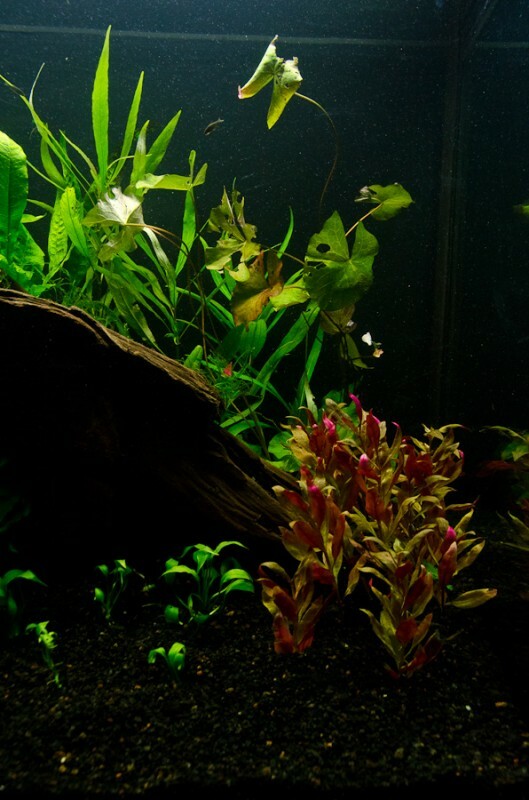 In my tank I choose to go with Miracle Grow Organic Choice Potting Mix (MGOCPM) as the nutrient rich base layer capped Instant Aquaria and Eco-Complete. 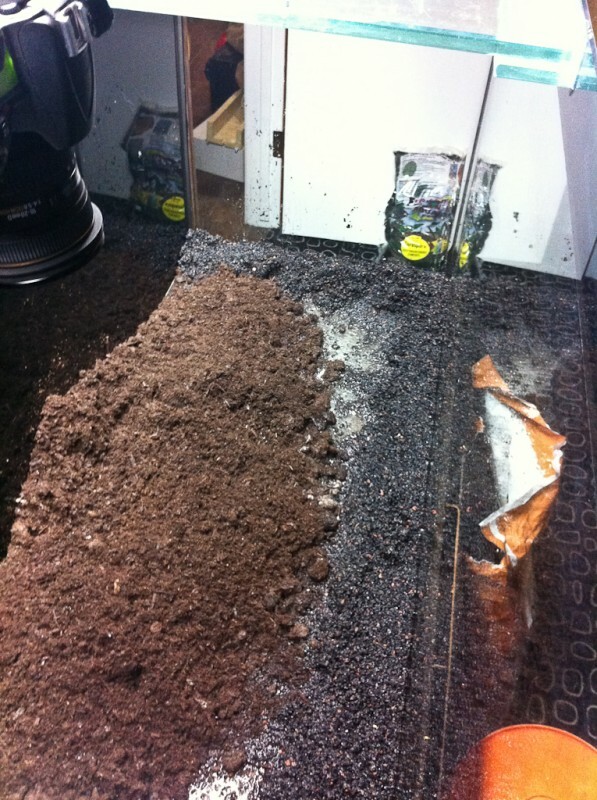 In order to hide the dirt start by making a border of your capping material around the front and side of the tank. 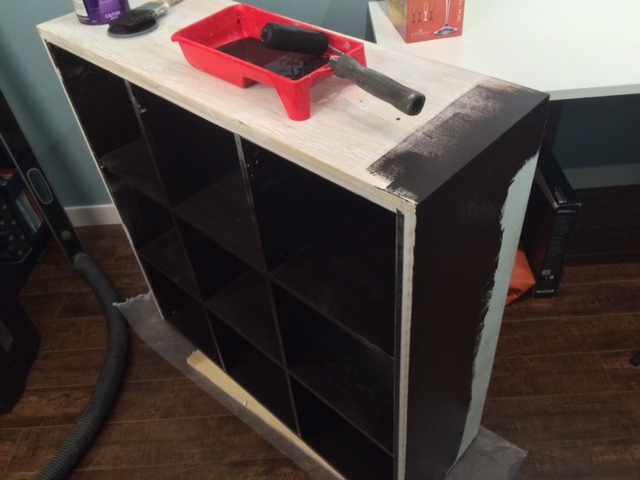 This will create an ascetic border and hide the layer of dirt. 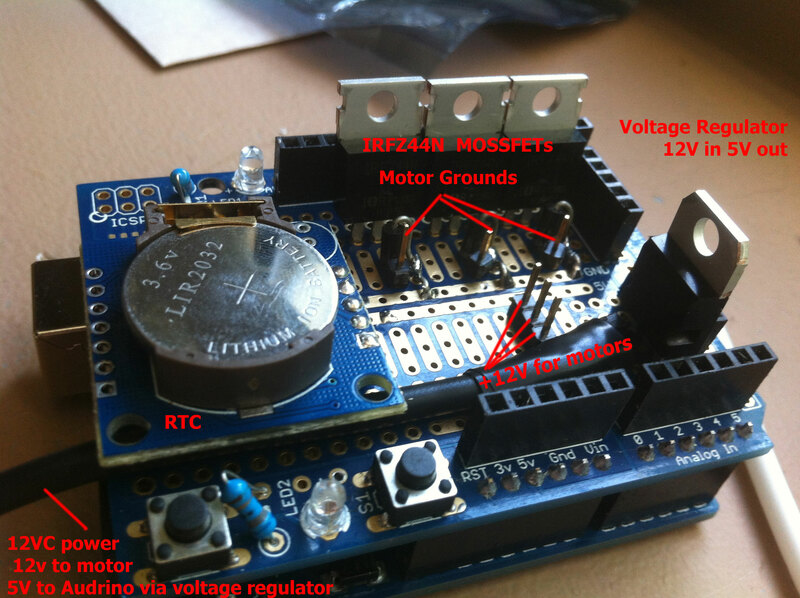 I generally do an 1.5″ ish layer of MGOCPM. 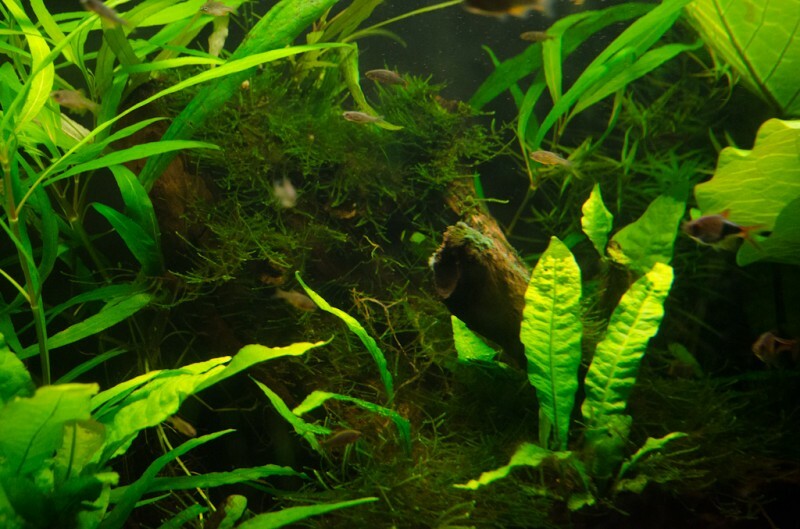 In a planted tank you want to shoot for at-least 3″ of total substrate thickness to make it nice and easy to get plants rooted. 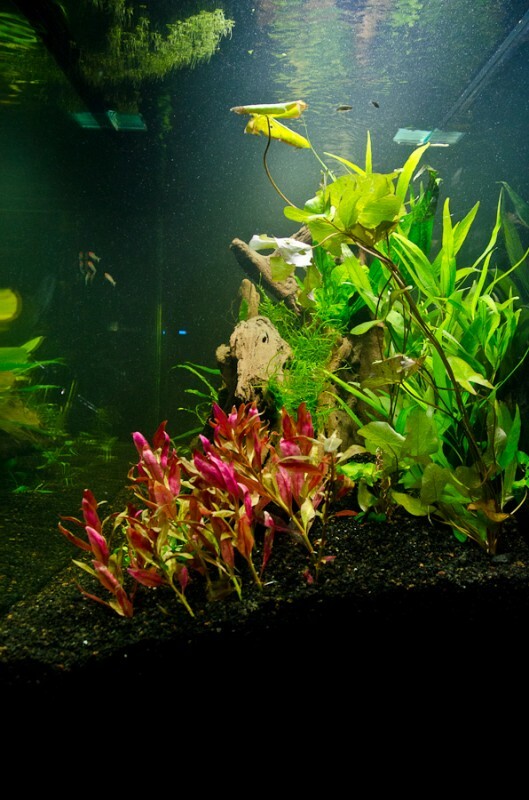 If your substrate is to shallow you will ricks plants being uprooted and floating around your tank. Finally you will want to cap your base layer find a top layer of Eco-complete or your substrate of choice to make an appealing base layer. 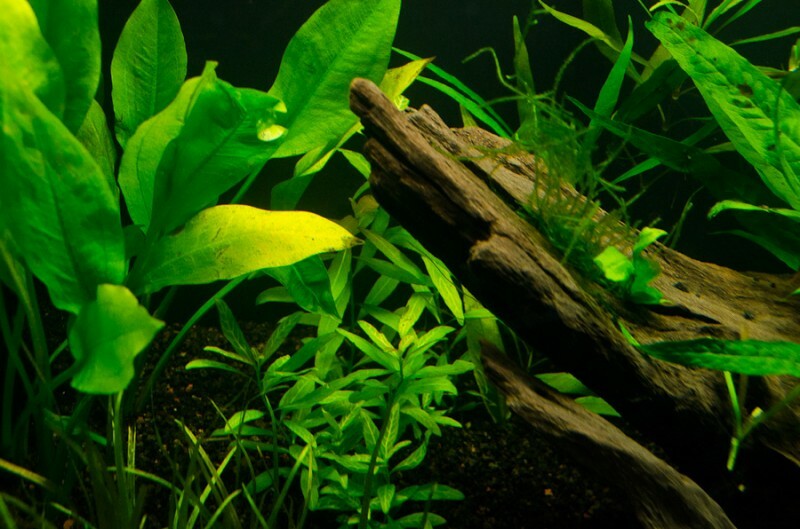 Egg laying fish love to spawn in live plants. 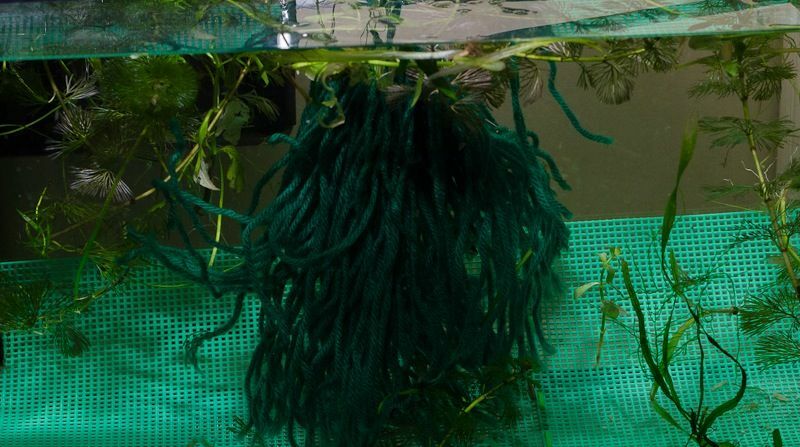 One of the common way to mimic these plants is the use of yarn. 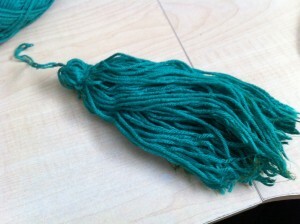 Be sure to pick a dark colored acrylic yarn as it will not break down in the water over time. I generally pick green since it best mimics actual plants. 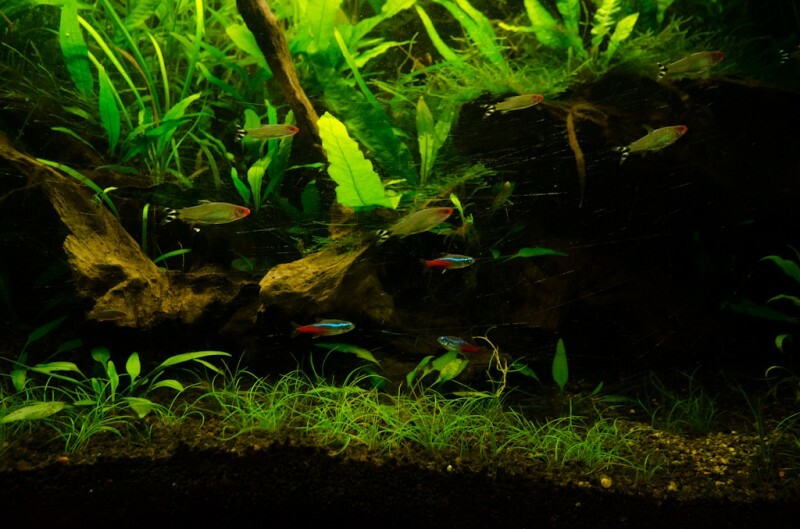 Alot of egg scattering tetras and danios tend to eat the eggs after the span which can reduce the number of surviving fry. Egg scatters tend to have less sticky eggs that will fall out of the mop if you shake it so be sure to have something underneath to catch the eggs if you plan on moving them. 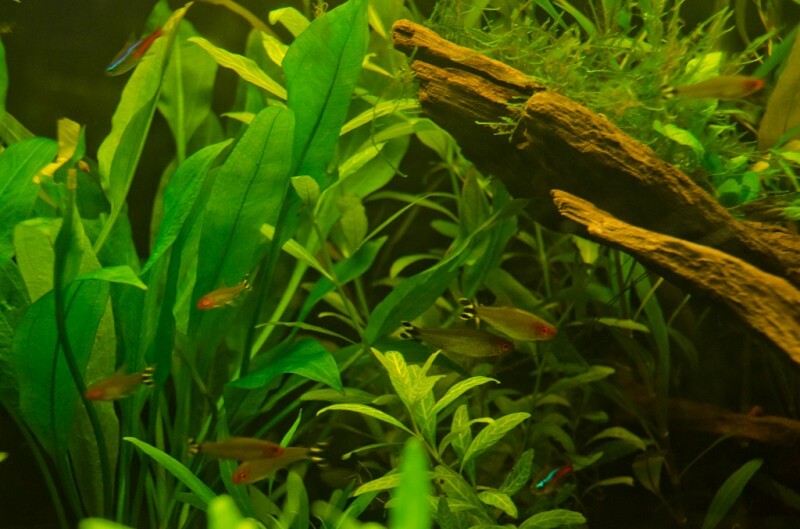 With most small fish its a good idea to separate the parents from the eggs once the span is over. 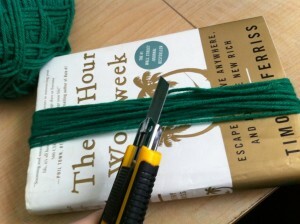 Start by wrapping the yard around a book about 100 times. 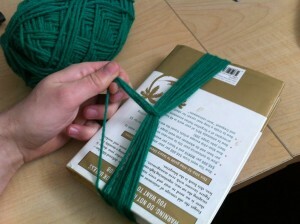 Next tie a not on one side of the the book to hold the strands together. 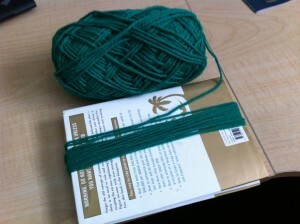 Tie another chunk of yarn at the top to create a blub on top and hold it all together. Next Boil the mop for at 5-10 minuets to leech out any impurities and make it tank safe.. The threads may float for the first 24-48 hours until the threads become water logged. 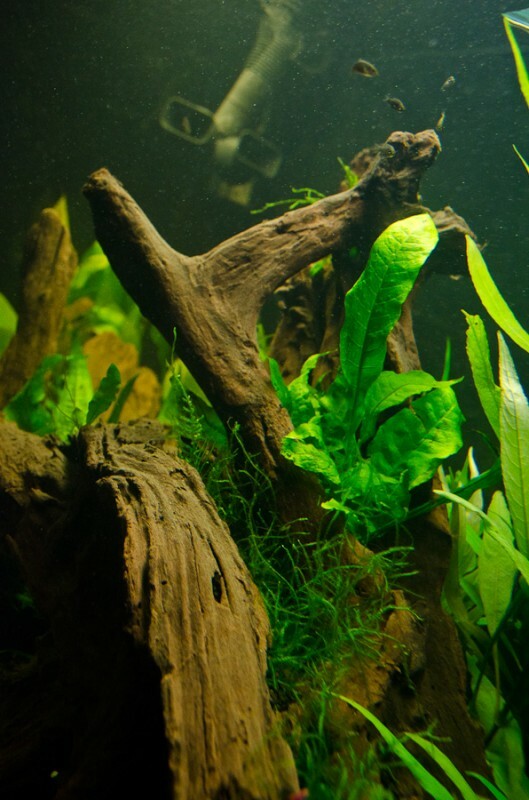 The mop can either be tied to the top of the tank, or to a cork to let it float around.